Embedded in a popular story about the most endearing Lord of all Beginnings and Conqueror of Hurdles, Ganesha, we will take a look at the role of parents, especially the mother in Indian society. 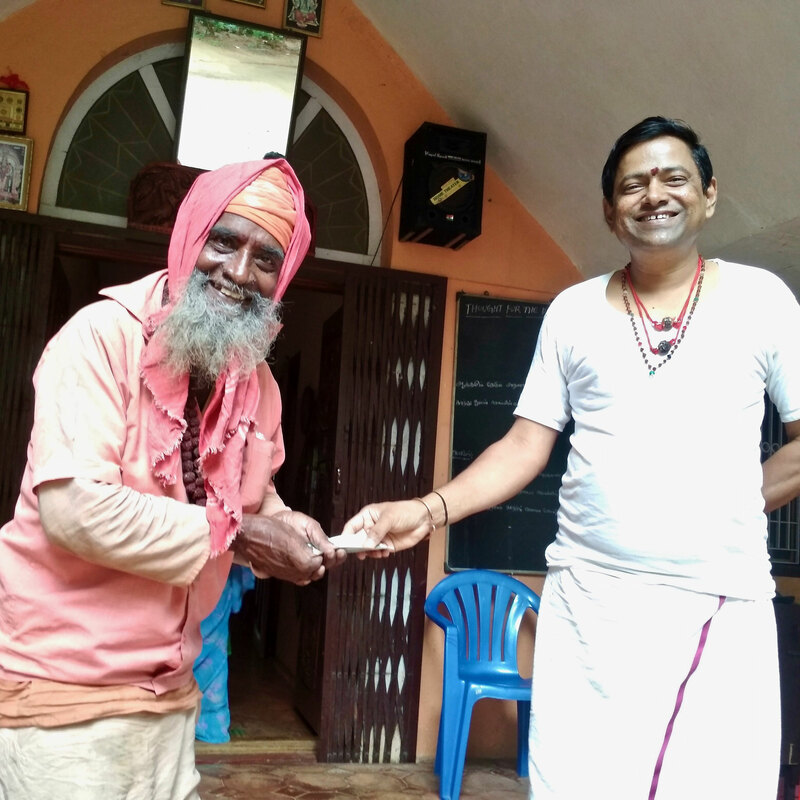 The second article deals with homeless people, who are sponsored by the Aum Pranava Ashram in various ways. 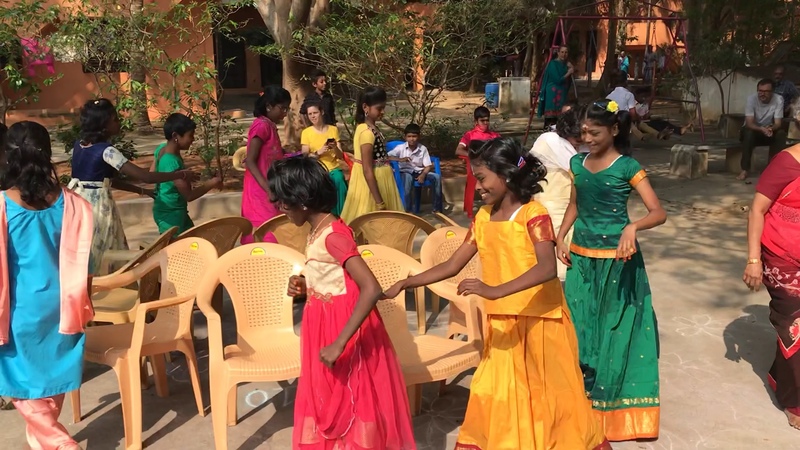 The timeline lists the most important events since Christmas 2018, focusing on the Christmas Celebration and subsequent trip to Puttaparthi with all the children and some staff members, the three-day-long Pongal festival and the Republic Day Function. 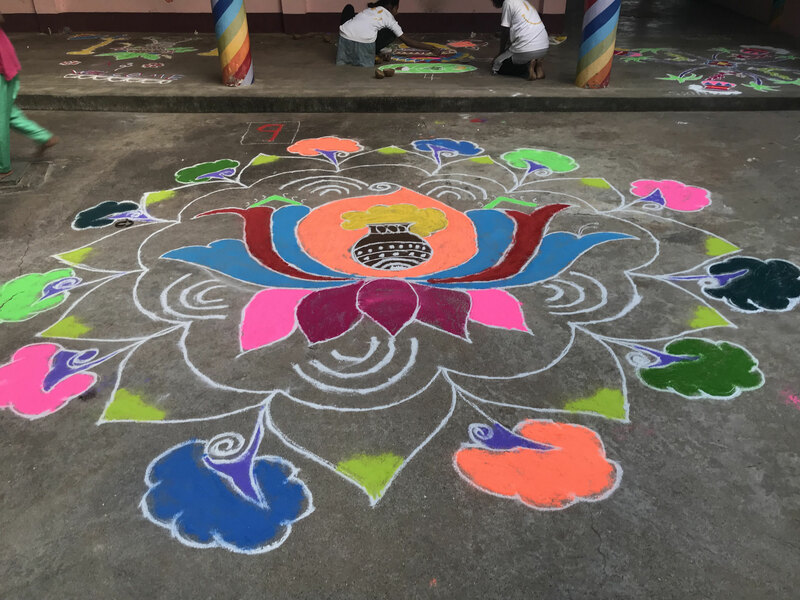 We will also have a look at the activities and events that await us over the summer months and the re-opening of the schools in June 2019. 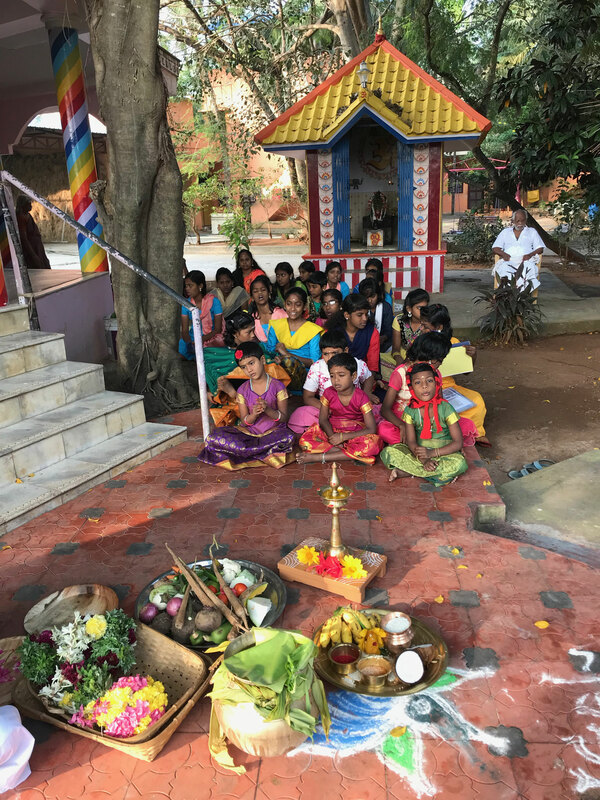 The following scene - children touching the feet of their parents in the morning before running off to catch the school bus, their schoolbags hanging loosely from their shoulders, while stumbling out of the house - can still be seen in India. Adults also pay their respect to the elders in the house before leaving home, especially when they go on a trip. 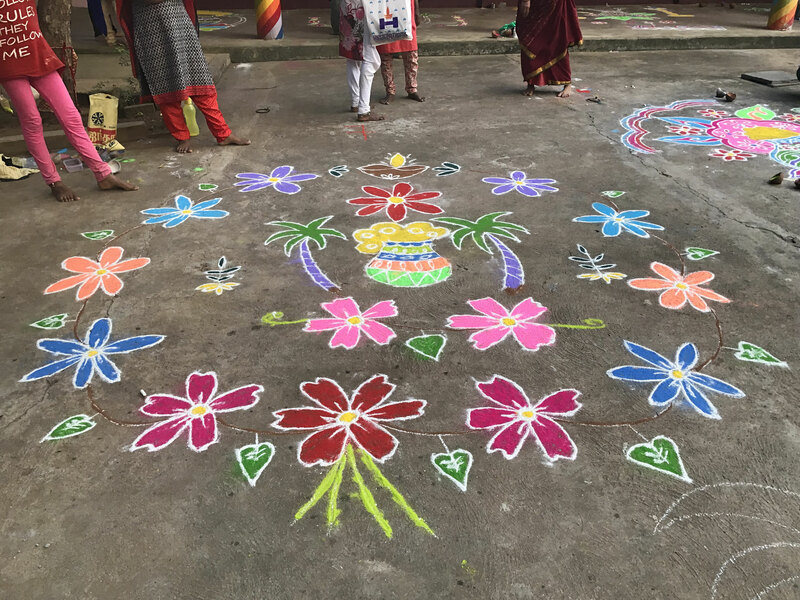 The following lines are part of the Vedic tradition and do not only extol the prominent role of the parents, but also set up two more important placeholders in the social construct of the Indian society, namely teachers and guests. Since time immemorial, the social fabric of Indian community has been woven with the warp and weft of these words. Each of these social persons mentioned above, mothers towering above all others, used to be highly respected and great care has always been taken to uphold this tradition throughout India. 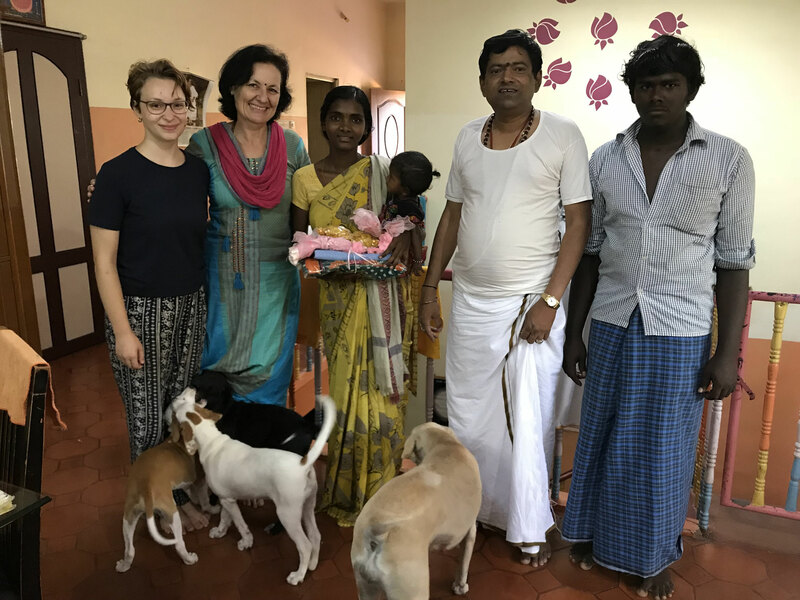 Indian hospitality is known in the whole world. In fact, as a guest you may not leave the house of a host without having consumed a meal or some snacks and a tea, or if nothing else at least a glass of water. It is considered impolite to reject something offered to you as a guest. The ideal student/teacher or Guru/disciple relationship is dealt with in the epics of Sanskrit literature, the Ramayana and the Mahabharata, as well as in many other scriptures, too. 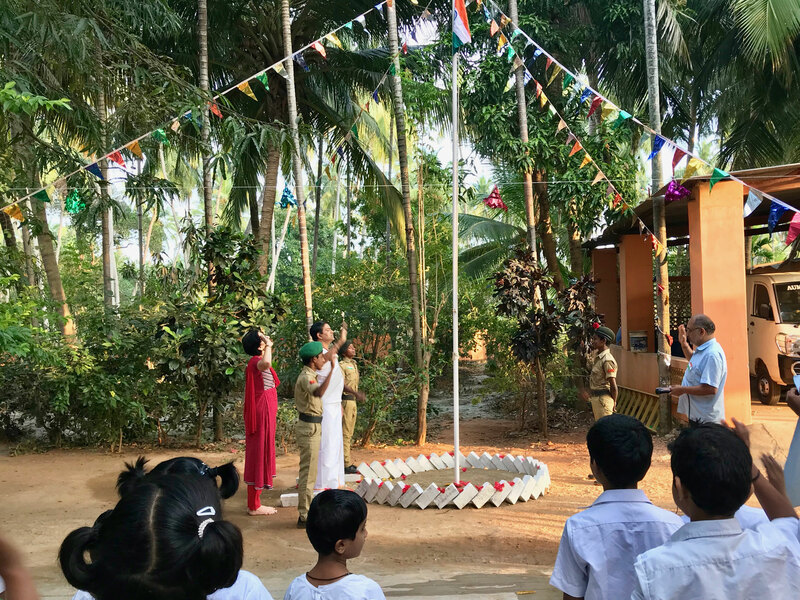 The social interactions are well defined in every-day life, and upon deeper reflection, it will become clear that a community upholding these guidelines - irrespective of geographical coordinates - is striving towards the noblest, Divine relationship of every-day-people in every-day-life. The lines quoted above do not reflect delusive attitudes of grandeur but hint at the play of high values like selfless love, truthfulness and leading by example in the field of social interaction. The responsibility that comes along with those lines will bring anybody aiming at false pretensions down to the knees. Mothers are leading this social hierarchy, since they exert the most significant influence on the child's psyche. 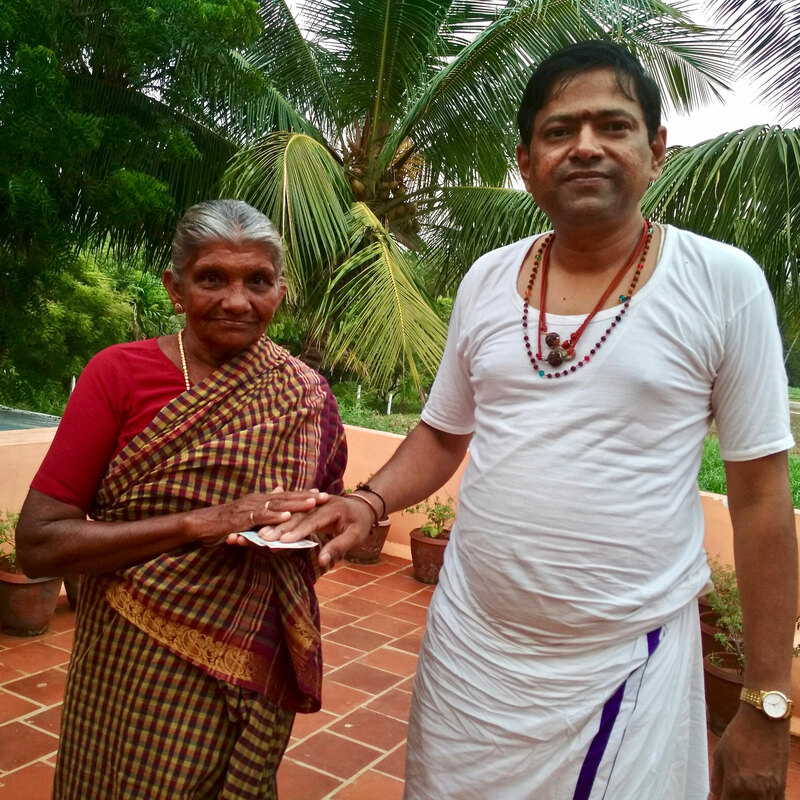 In India, theoretically and practically, the mother is and always has been worshipped as the first and foremost Guru of a person in this world. 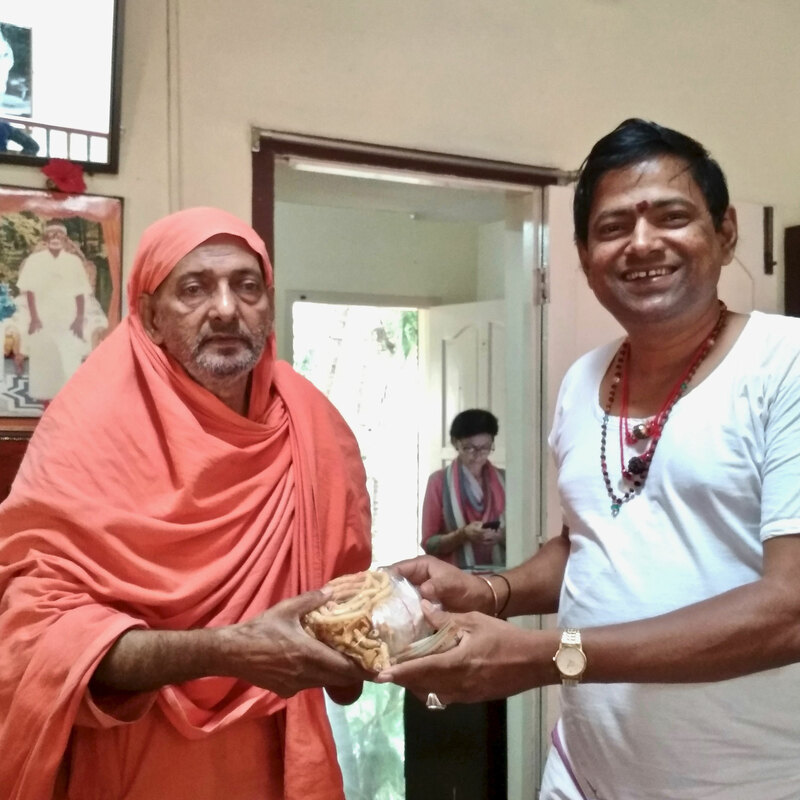 The following, prominent short story from the puranic treasure box entwining around Lord Ganesha illustrates the weight given to parents free from religious or community-related identities. Of course, the statements made above express a highly idealistic attitude and looking at the world today they have definitely lost some of their splendor. In the course of successive generations, social traditions, rules, and hierarchies cannot stay the same, and it has to also be said that newspapers are replete with reports exhibiting the exact opposite of what was said before. Still, mothers and fathers, despite the fading agent of TIME, are revered, and many young people take their parents as role models in their lives. 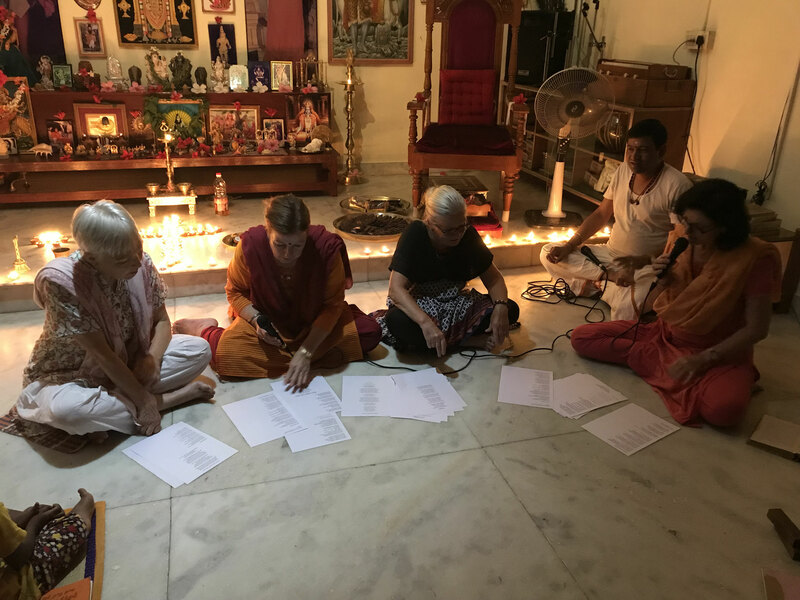 In the Puranas, Narada is known as a globetrotter, a traveler who can move between the worlds of the Gods and our own world of ordinary mortals irrespective of physical and ethereal borders. Unhindered, he makes his way from the mortals to the Gods and back again, to request help and advice for solving mysteries or queries related to essential matters of the world and the existence therein. Incidentally, he often causes confusion and upheaval, even though his quests always lead to meaningful discoveries and more wisdom. The story bestows us glimpses of Ganesha's creative and deeply intelligent nature. Not without reason is he hailed as the conqueror of all obstacles! Our present story deals with the most precious object of all, the Fruit of Wisdom, which - in our case - takes on the shape of a tasty mango. The twist in the story is the fruit’s indivisibility. It can be given to one person only, which causes a precarious imbalance between two brothers, as we shall see. Narada visits Lord Shiva and his consort Parvathi at their residence, with the fruit of wisdom mentioned above in his hands. 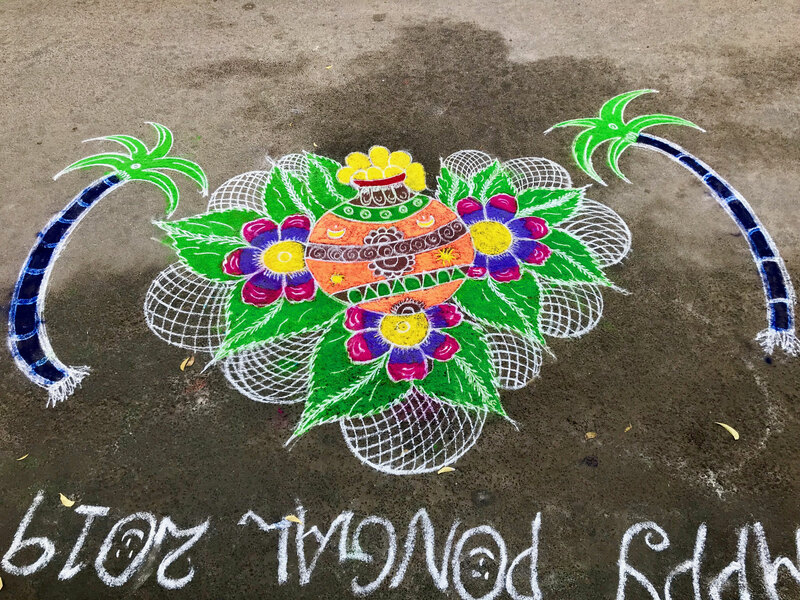 In the household of Shiva-Shakthi, there are two sons: Ganesha, the elder one, the Conqueror of Hurdles and Lord of All Beginnings, and Subramaniam, the God of Good and Mighty Deeds and the General of Army Forces, who is also known as Lord Muruga in Tamil Nadu. On seeing Lord Shiva, the Master of the Universe, and his consort, Goddess Parvathi, the Ruler of all Energies, Narada realized that he might have brought the proverbial owls to Athens and felt a little insecure, not being sure whom to endow the legendary fruit with! If only it had been shareable, he could have just offered it to both brothers, making the whole family happy, and return to his home in peace! But under the given circumstances, fraternal strife was hardly avoidable. After some deliberation, Lord Shiva had an idea! The fruit would be given to the winner of a race three times around the world. Whoever arrived first at the spot of origin would be awarded the precious mango. 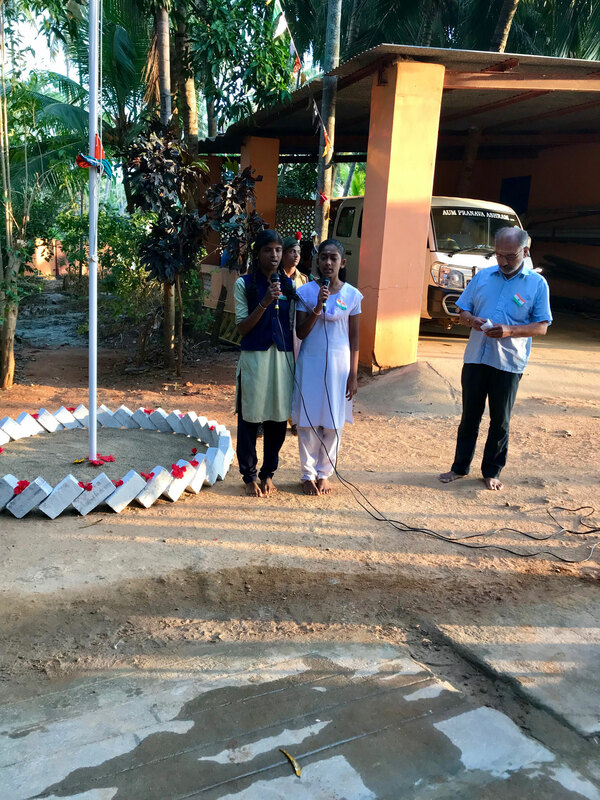 As soon as he had finished announcing the rules of the game, Muruga readily mounted his vehicle, the peacock, and flew away - without even looking back and quite sure of his impending victory. The peacock and his Lord being swift and agile, the odds seemed to be in their favor! Looking down at his own vehicle, a mouse by name Mushika, who was definitely smart and swift, but could by no means fly, Ganesha realized the hopelessness of his situation. Mushika's innocent and embarrassed smile could also not help to improve her master's predicament. So many obstacles! An awkward silence spread around Ganesha, and everybody stared holes into the ground, not knowing where else to look. Ganesha’s face started showing signs of deep reflection, his eyes were closed, and his large ears stood very still. After a few moments of suspense, his face lit up with splendor! His eyes overflowing with love, he looked intently at his parents who returned his gaze in anticipation. His face was beaming with confidence, because he had found a solution which would inspire millions of people over many generations to come. Without a word, he bowed down before his parents in profound veneration and began to circumambulate them with folded hands. Upon completion of three rounds in this way, he touched the feet of his parents and stood in front of them. All the witnesses there gazed at Ganesha, not sure what to think of all this, until Lord Shiva, the Father of the Universe, cleared his throat and said, "My dear son, what does all this mean?" 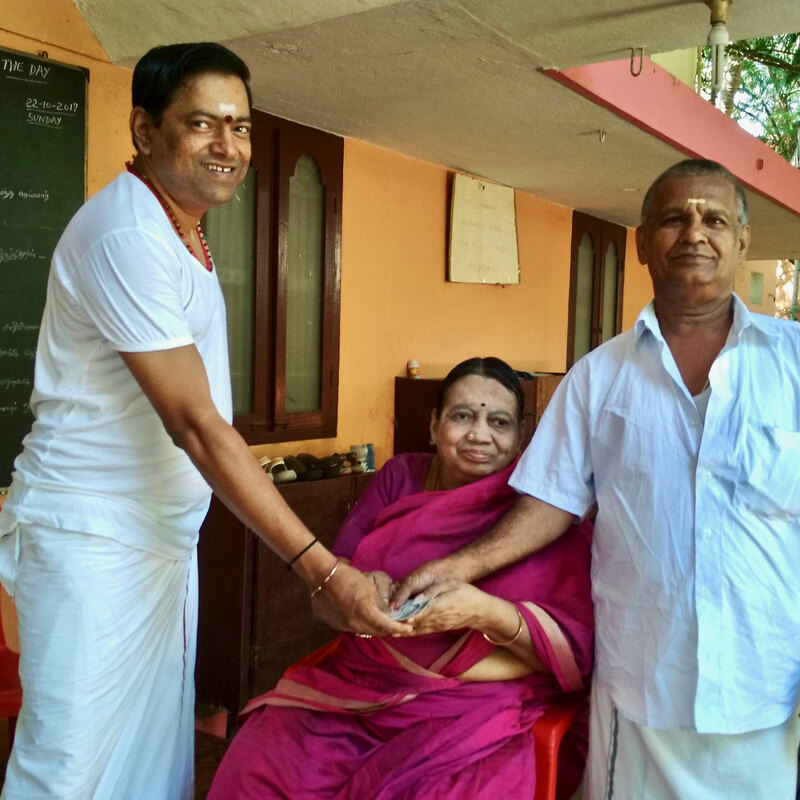 Triumphantly, Ganesha replied in short and unequivocal terms, causing the people to break out into exclamations of admiration, "My parents mean the whole world to me. Without them, I would not be here, and the world would not exist for me. Paying my highest respects to my parents, I have circumambulated them, and by doing so the whole world, three times. My parents and the world mean the same to me. I trust that you see the truth in this and am confident of being deserving of the fruit of wisdom." With great joy and deeply impressed by Ganesha's brilliant creativity, Lord Shiva presented him the most coveted fruit of all. Ganesha started eating the mango immediately, without further ado. Narada smiled at the scene presenting itself to him, he was obviously satisfied with the result of his quest. And so, it came to pass that from then on people of all colors, creeds, and origins began to revere their parents as the microcosmic image of their trusted world. Even today, when a father and a mother fight in front of a child, it is as if you could see and hear a part of their world break into pieces. Some attentive readers will be wondering now about what happened to Muruga? It is a long story, which I am going to recount in small detail for the sake of the wholesome message conveyed by it. Even before Ganesha could finish eating the mango, Muruga could be seen approaching the finish line in great anticipation of his victory! All the more, he was genuinely shocked and outraged to see the remnants of the fruit in the hands of his brother! In this place, I would like to remind the reader of the puranic nature of the stories. Gods and Goddesses are seen with weaknesses and experience difficult or hopeless situations, which will be dealt with in an exemplary manner, thus driving home the real meaning of the story. In ‘real' life, the truth can be bitter, and stories or allegories make it easier for people to ingest the unpalatable truth underneath the sweet coating, sometimes using humor to ease its way into the reader's mind. The stories are meant to foster the good side in man, impart consolation and hope and encourage him to adhere to the eternal values and virtues of Love, Truth, Peace, and Righteousness. Let us return to our story. Everybody tried to calm Subramaniam, whose pride was deeply hurt, but neither soft words nor explanations could soothe the stinging pain of defeat in his chest. He was in great turmoil and was ready to even leave his family! Only Lord Muruga's self-awareness could sever this truly Gordian knot. He was so disgusted with the world that he renounced everything in an instant, left the scene and walked away until he reached the peak of a mountain where he sat down and went into deep meditation! 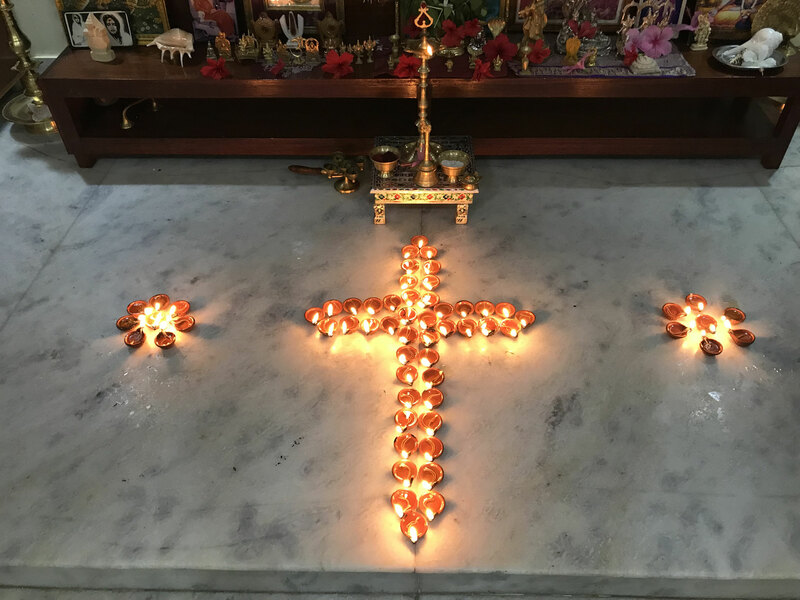 This place where Muruga turned into a young monk - free from pride, pomp, and majesty - came to be known as one of the most famous temples in Tamil Nadu by the name Palani. 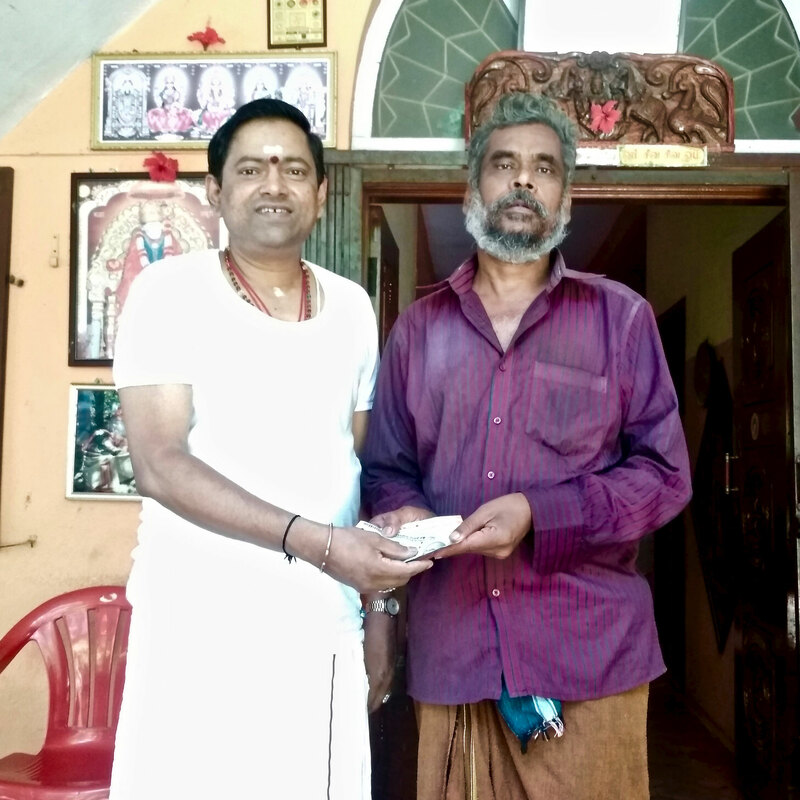 Palani is a temple of renunciation. 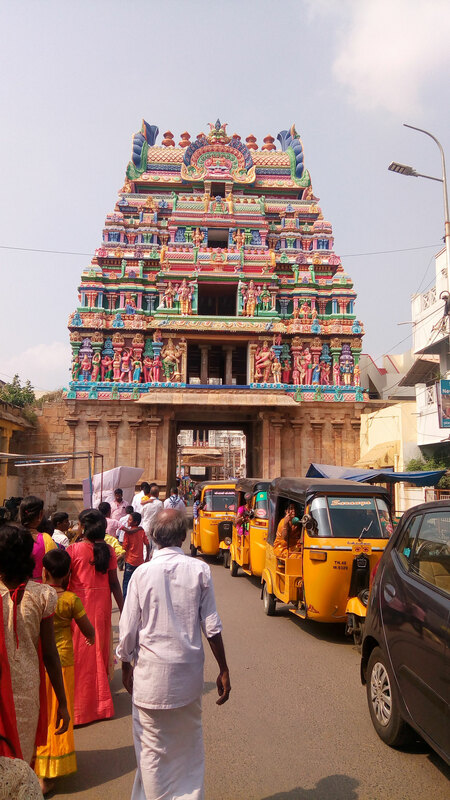 Bogar, one of the eighteen ancient Siddhas of Tamil Nadu, created an idol of Lord Subramaniam for this temple by virtue of his alchemistic knowledge. He mixed nine poisons and transformed them into an amalgam (navapashanam) which is said to be a highly effective cure for all kinds of diseases. The temple’s core message is transformation, catharsis, and metamorphosis. Whenever I think about this story of both Lords, Ganesha and Muruga, I wonder whether Narada knew beforehand that both brothers would finally be endowed with the highest wisdom, one by obtainment and the other by renunciation of the same object! 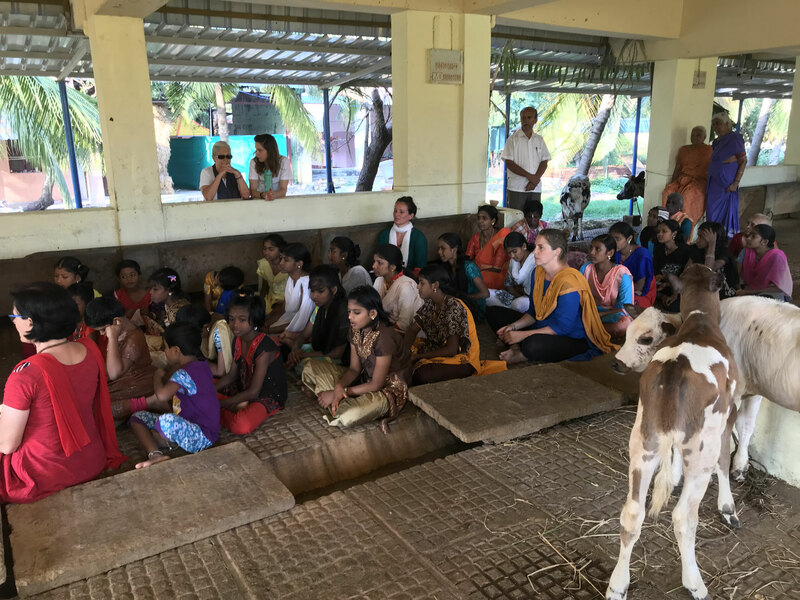 The Aum Pranava Ashram Trust supports 45 women and men with monthly, moderate, financial contributions. The height of the amount depends on the individual's situation, the criteria being health, availability of shelter and food. 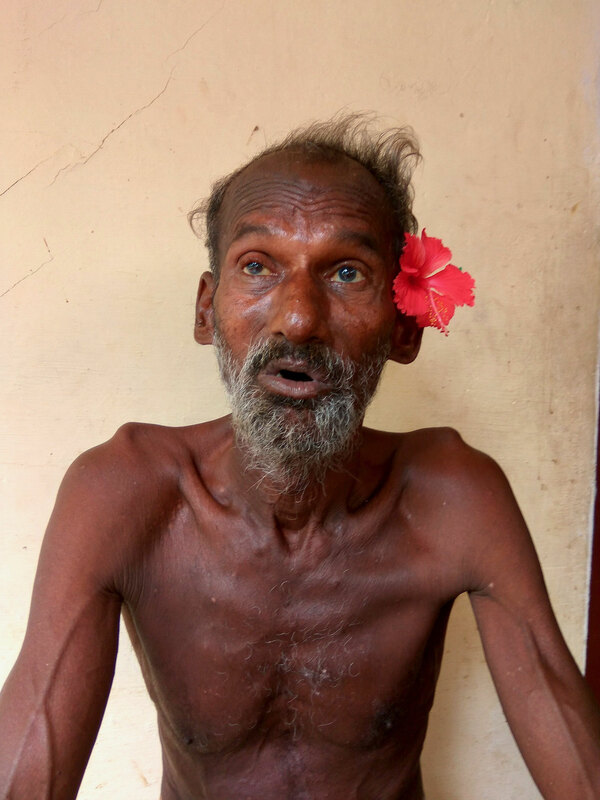 Mental impairment, physical disabilities, amnesia, and other diseases are the most frequent causes of extreme poverty they live in. The majority of them is homeless. Homeless wanderers are either extremely independence-loving (like mendicants) or belong to the rather large group of mentally imbalanced people who roam the streets. Their social and individual behavior reveals an afflicted state of mind which often bars the way to re-integration or rehabilitation. 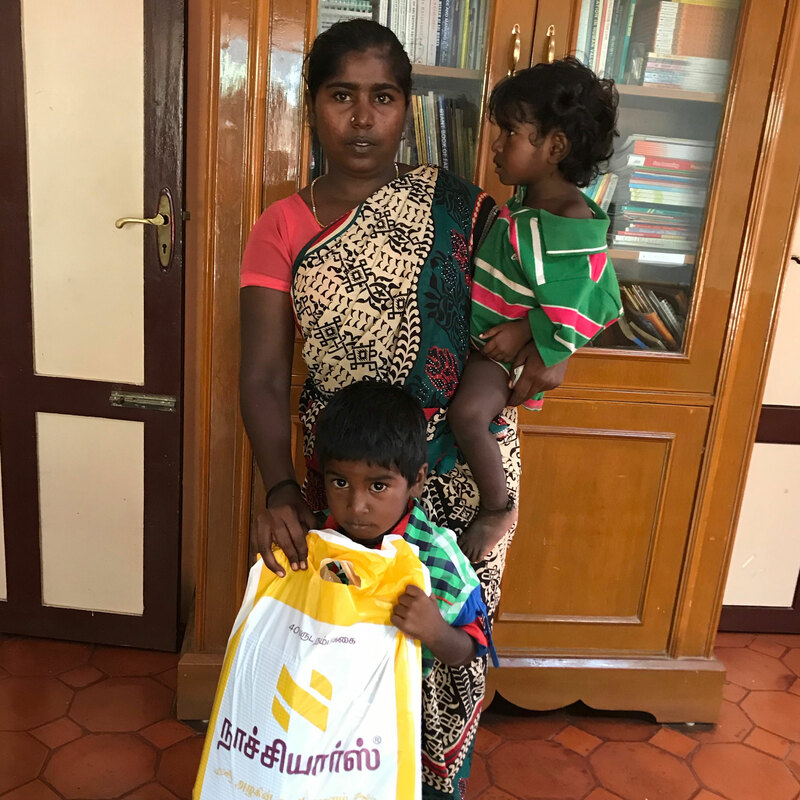 Another group of beneficiaries is single mothers with two or more children who earn a meager living by washing clothes or vessels in other households, but not enough to keep their family healthy and safe. 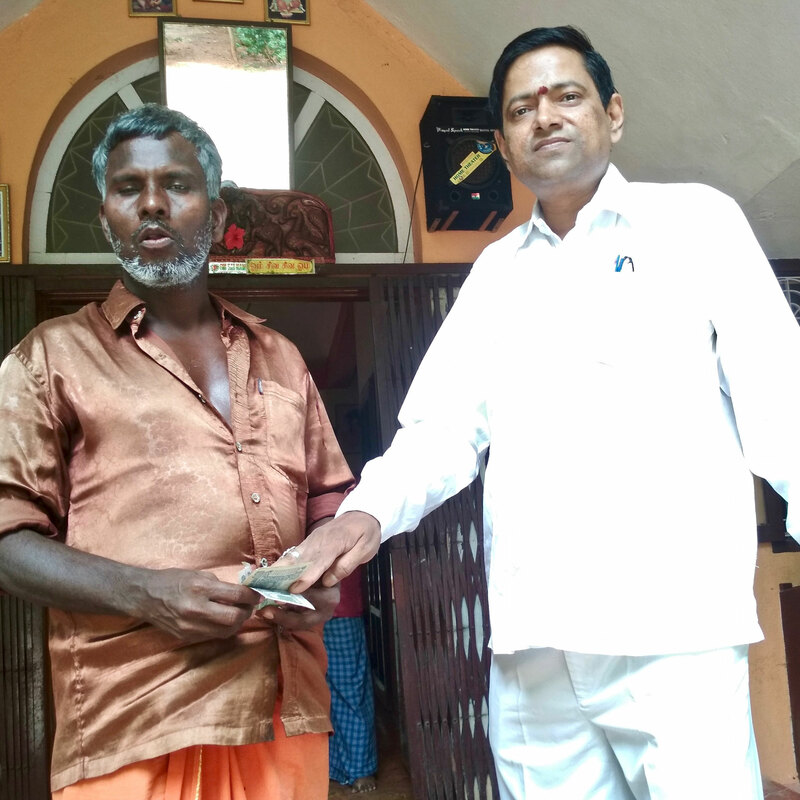 They depend on various charities to sustain themselves and their children. 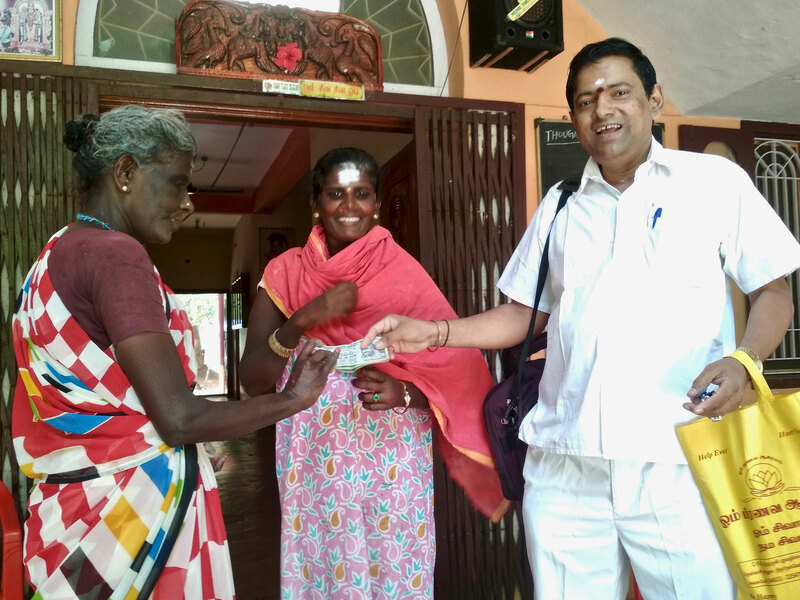 At the beginning of each month, the beneficiaries come to the ashram to pick up their monthly grant. 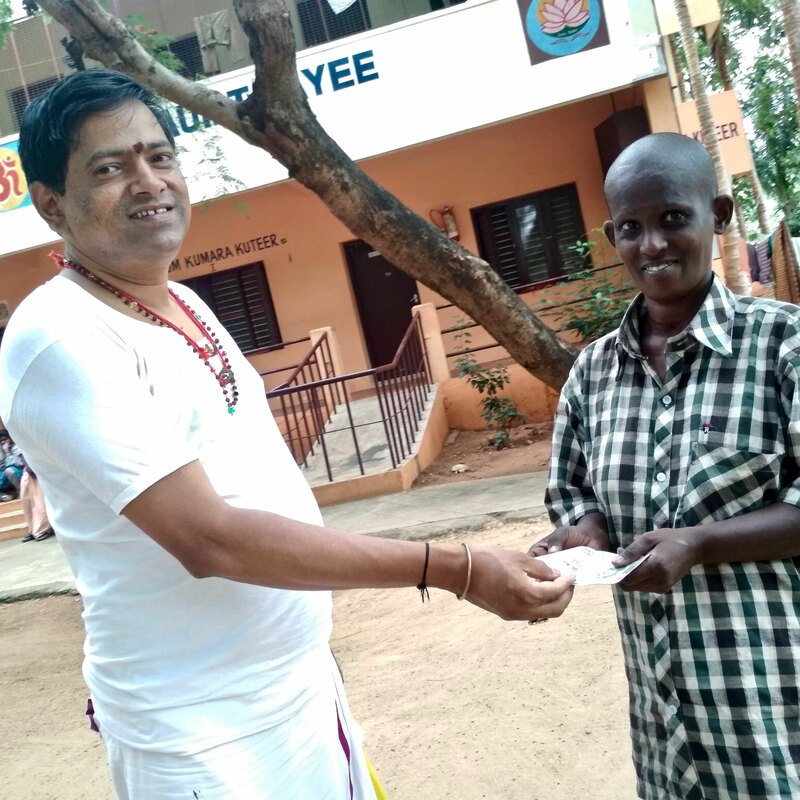 As an ashram, being dependent on donations ourself, we are not in the position to fulfill all their financial needs, and we also do not aim at such charity. 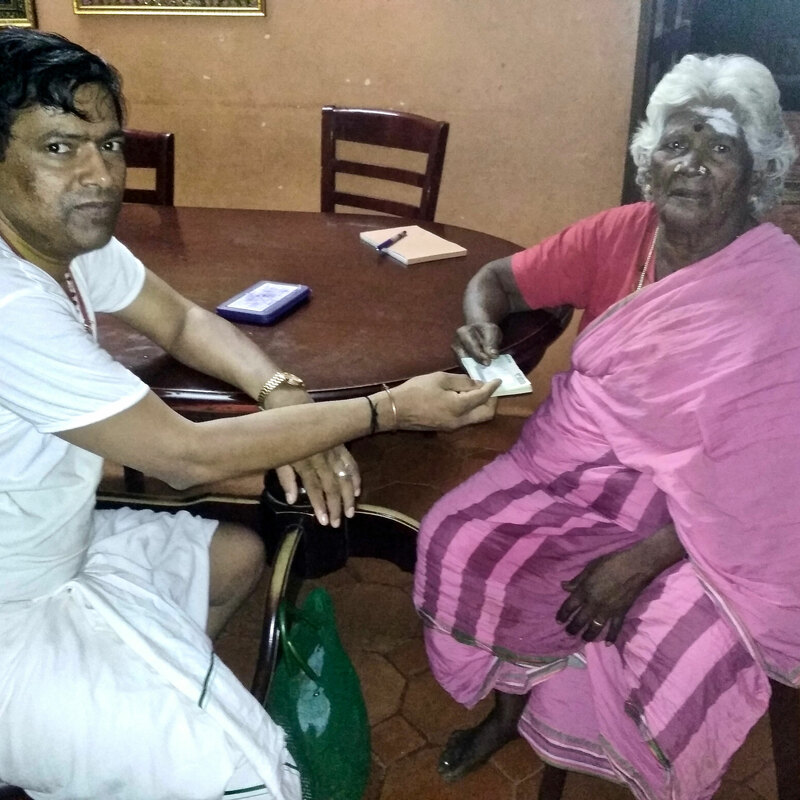 What we really care about is "jeevakarunyam," the token of love and compassion which should be part of human society. This world does get abundant glimpses of greed, grudge, and jealousy - let us give weight to the opposite of it, generosity, goodwill, and sympathy! The man on the photo to the right who is absorbed in writing is Kumar Chettiyar, aged 60 to 65 years. 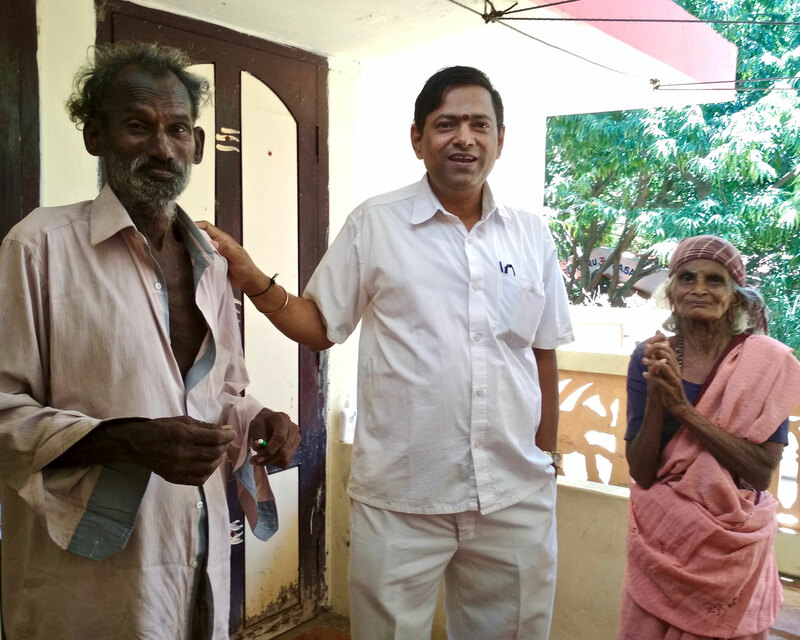 Everybody here calls him Chettiyar Thaatha ('Thaatha' meaning 'Grandpa' in English). 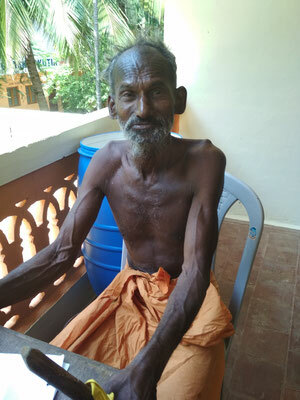 For many years he had been roaming all the streets between Tenkasi and Ambasamudram, the sky alone being the roof above his head, before coming to live in the Aum Pranava Ashram, where he is staying since three years now. 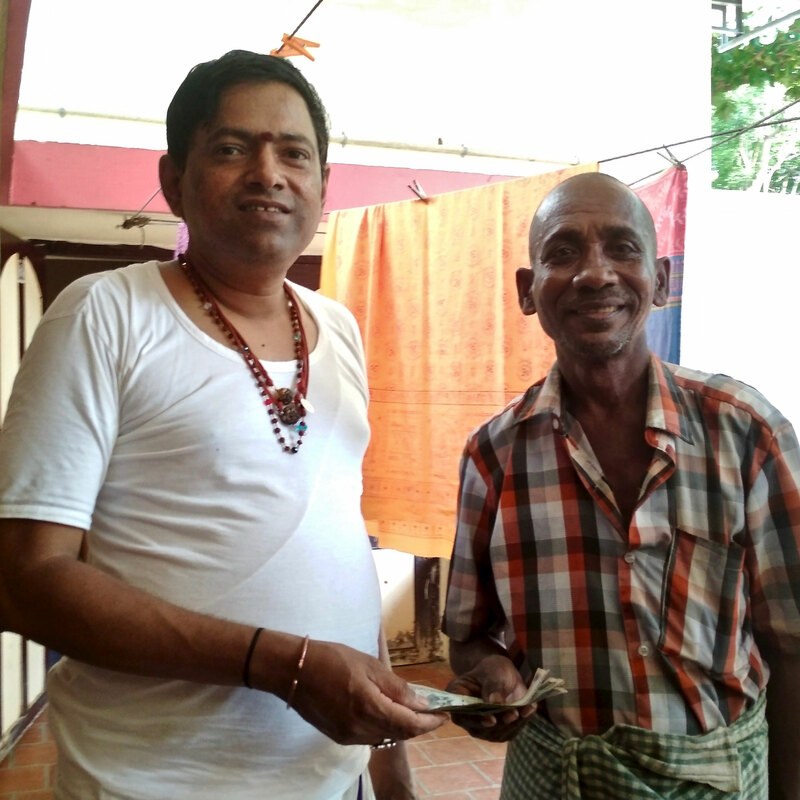 Besides many other good qualities, Visvanathan, the head of the ashram, who used to travel a lot through the streets of the surrounding towns and villages on his bike, has a big heart for people living on the street. 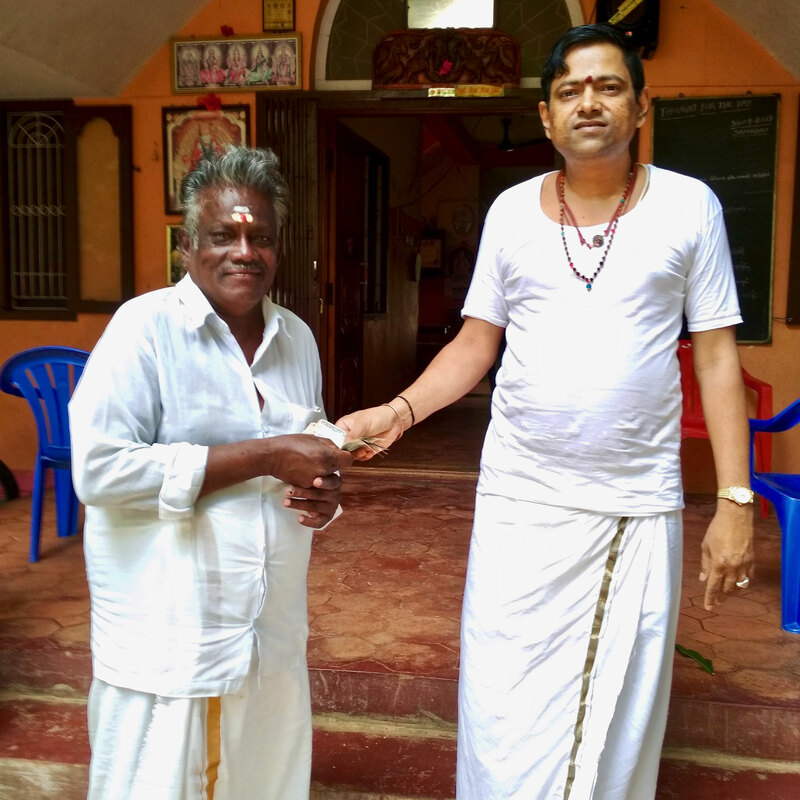 Chettiyar Thaatha and Visvanathan met frequently on their 'tours' and they shared an affinity which drew Thaatha closer to the ashram. 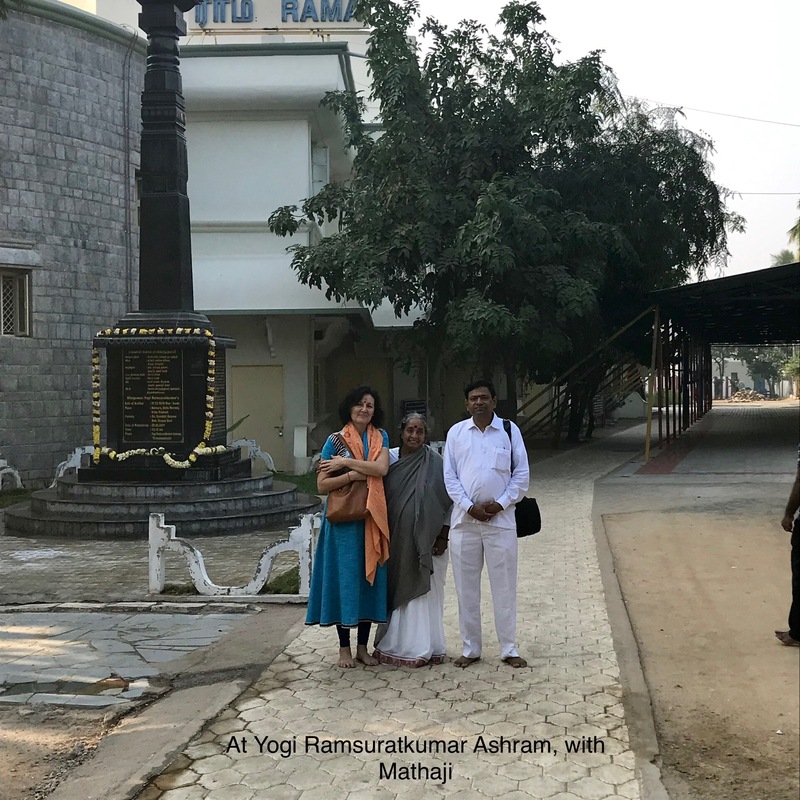 After quite a few years of knowing and meeting each other casually, Thaatha moved inside the ashram. What started out as an experiment, became an every-day affair. 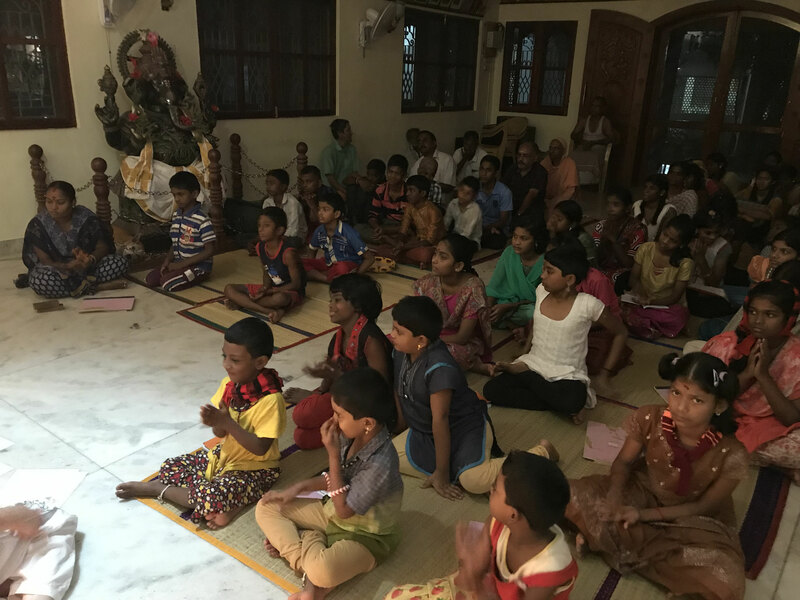 At the beginning of Thaatha's relationship with the ashram, due to his frequent and uncontrolled fits of anger and confusion, we could not fully embrace the possibility of integration into the ashram community with children and other elders being consistently at the receiving end of his running commentaries. He came only for the night shelter and left in the morning to resume his roaming routine. One day, as if a stay order had been given to him, he stayed inside. Until today, nobody knows who made this decision, but gradually, he reduced roaming and increased the effort to tune into the ashram life. It was a strenuous effort, to say the least. Luckily, at this time, we discovered the fact that Thaatha liked "writing." 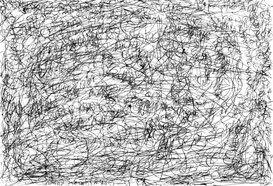 Sometimes, when he was furious, he would take sheets of paper and start scribbling away, filling those papers with all his thoughts, and thus gradually emptying his mind and silencing his running commentary. Sometimes, he would fill as many papers with his thoughts, written so intensely, as it takes to drain the whole ink of a new pen in one go. Thaatha is a 'writer' who uses his own letters which nobody can read. They look more like doodles or just mindless scribblings to readers unaware of the purpose behind these papers. Since he often comments on what he is writing, we assume that he does want to be understood and that the sheets of paper do serve a purpose of communication. 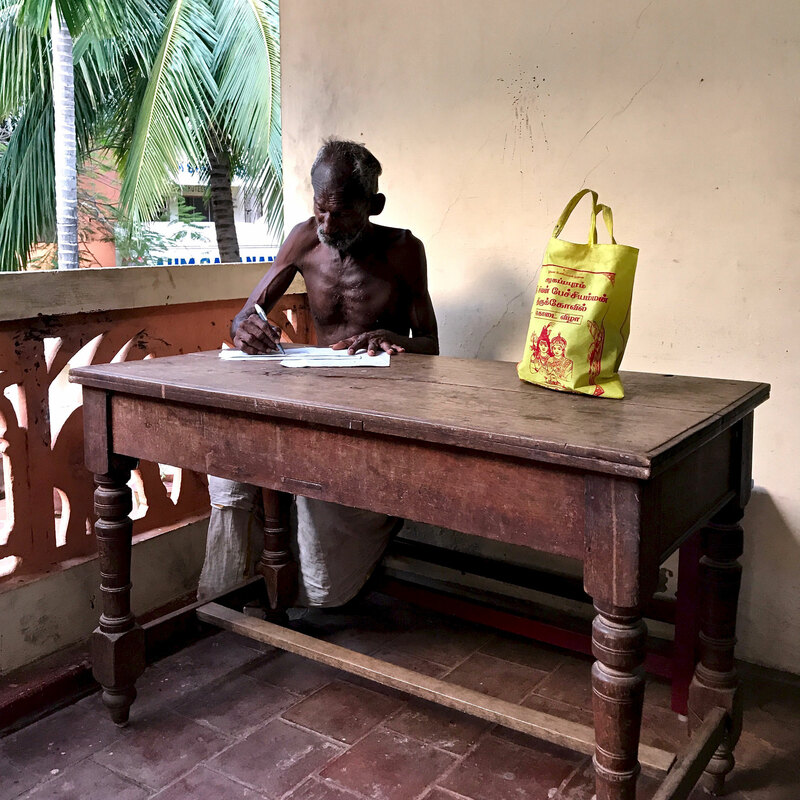 After finishing his work, he looks for somebody, usually Visvanathan or me, to hand us the papers as if to convey that his office time is over now. 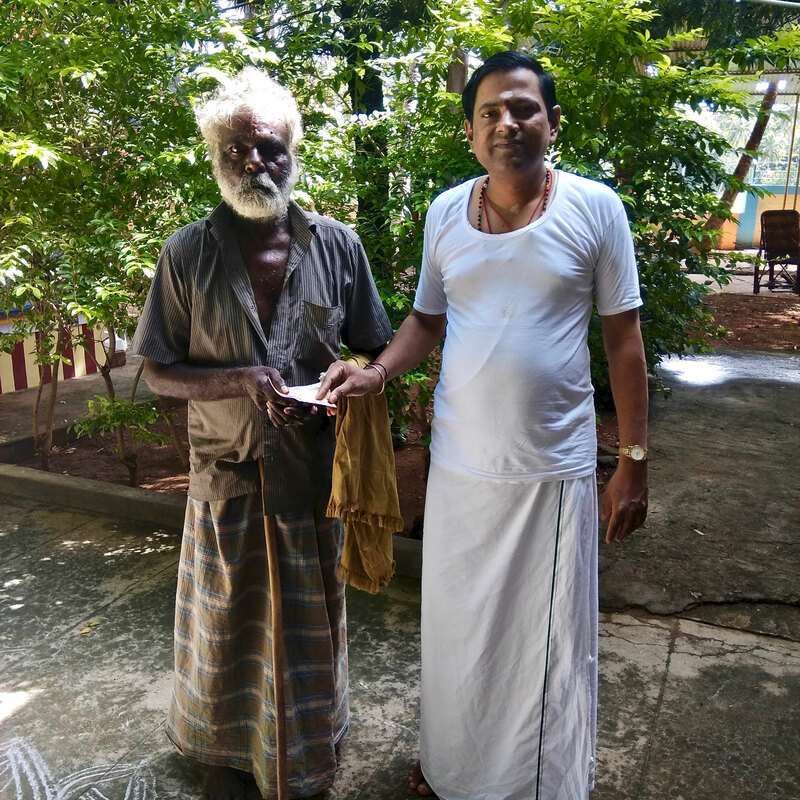 We take this seriously and have always encouraged Thaatha to write and work more by paying him a little 'salary' which he usually spends for snacks and tea. But whenever he gets a bonus, he buys things mostly for us, not for himself! 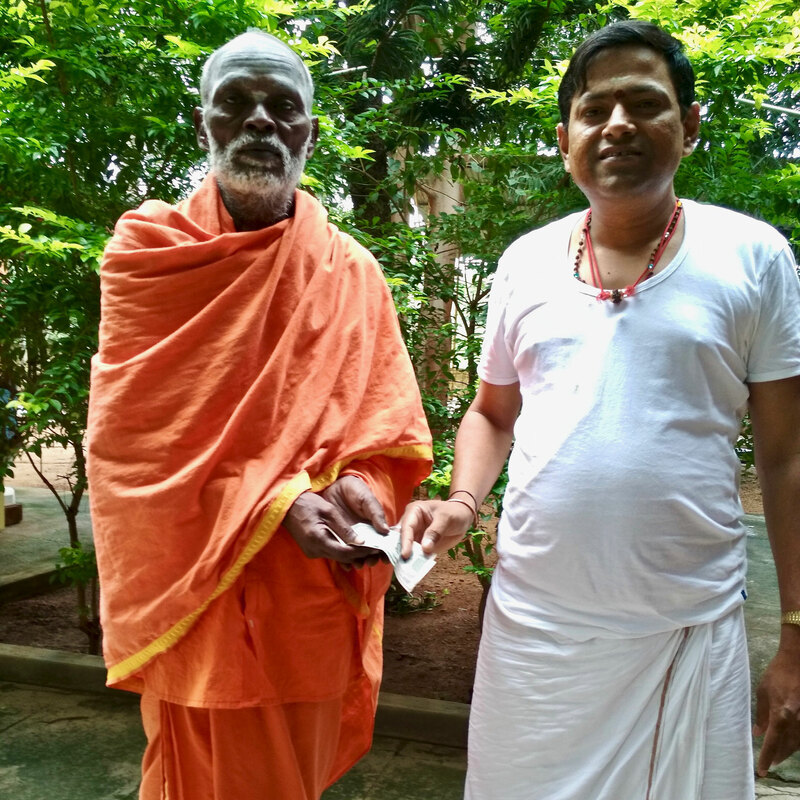 His transformation from an angry street beggar to an individual ashram resident is impressive. 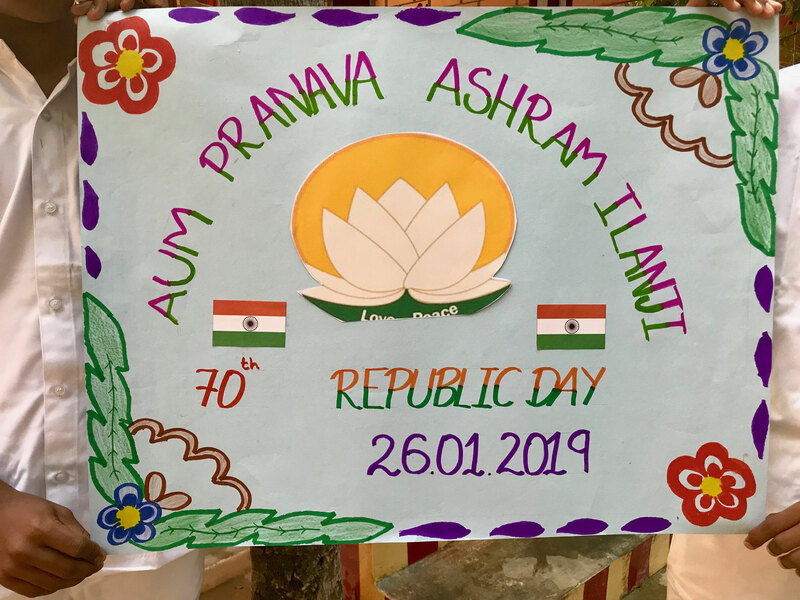 The photo on the right outer side with the flower behind his ear (our junior office ladies like to do this), remind us more of his explosive habits, whereas the friendly photo to the left is expressive of his more peaceful and happy states of mind. One and a half years lie in between these two pictures. 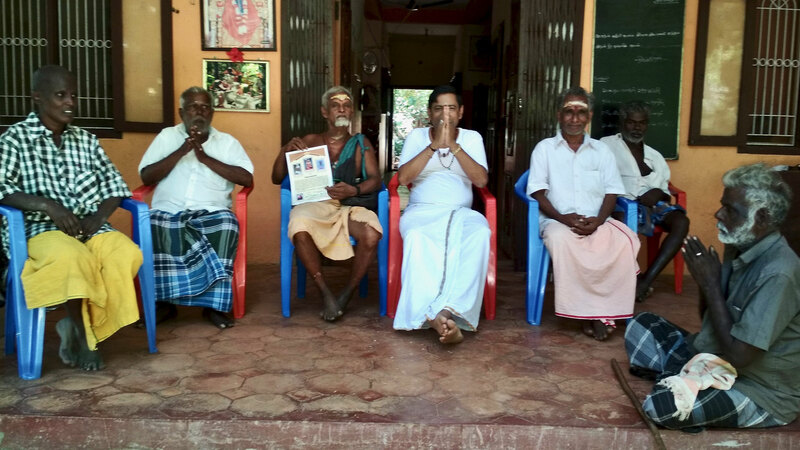 Some time ago, by sheer accident, we could trace Chettiyar Thaatha's wife (the woman in a violet sari on the right side photo) who lives with her relatives in Tenkasi. 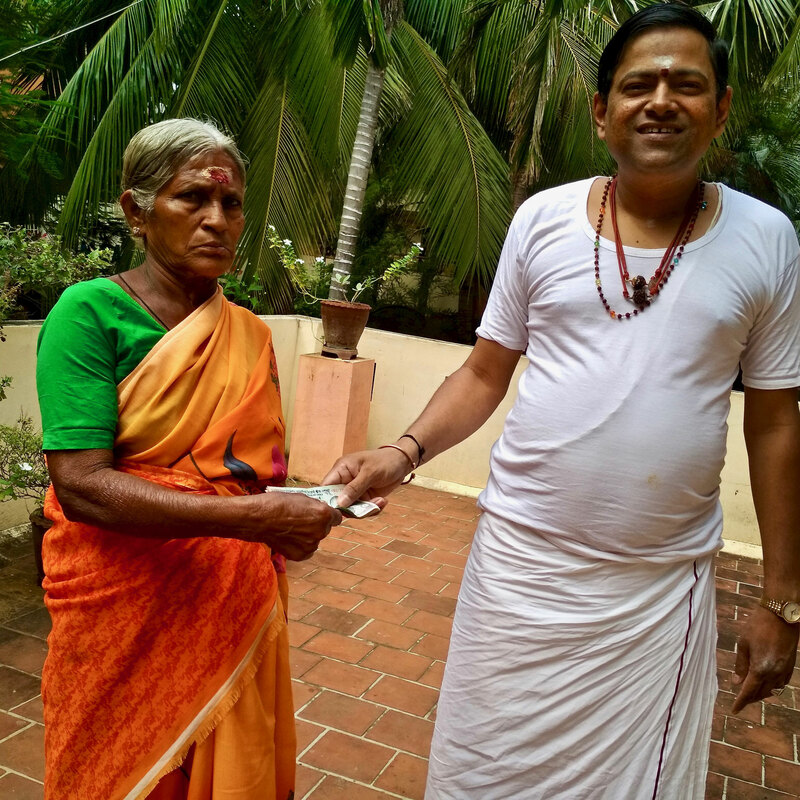 She visits Thaatha - who recognized her - every now and then, stays for a few days in the ashram to help in the kitchen and goes back to her life in Tenkasi. 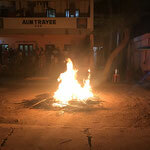 Thaatha remains a lone wolf, and as long as he wants to live a peaceful life in the ashram, he is welcome to do so. 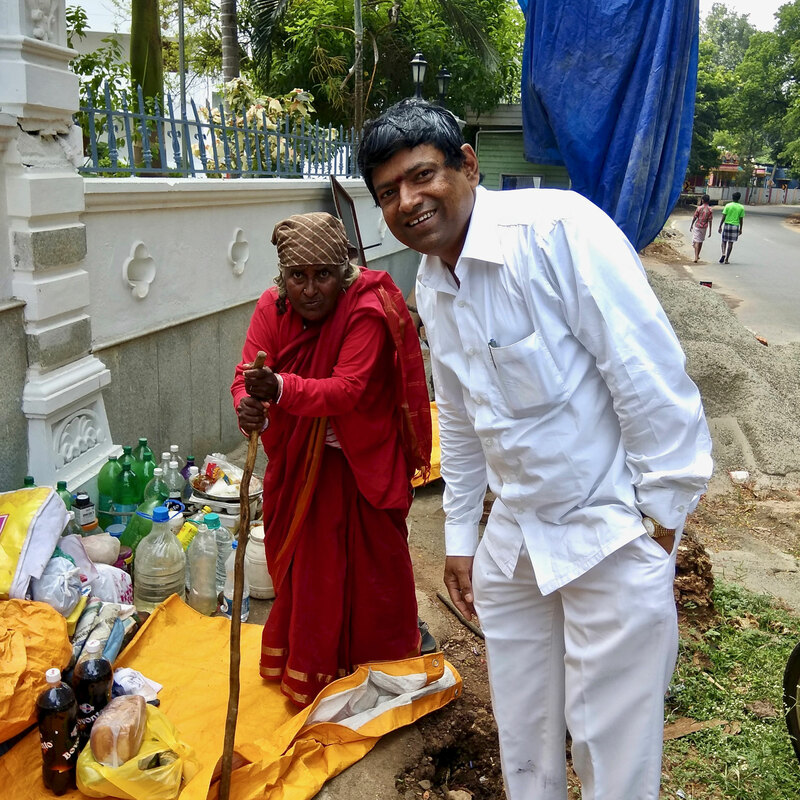 Since many years, the woman in red on the photo to the right side lives on the street. Her name is unknown, and she does not want to speak to anybody. 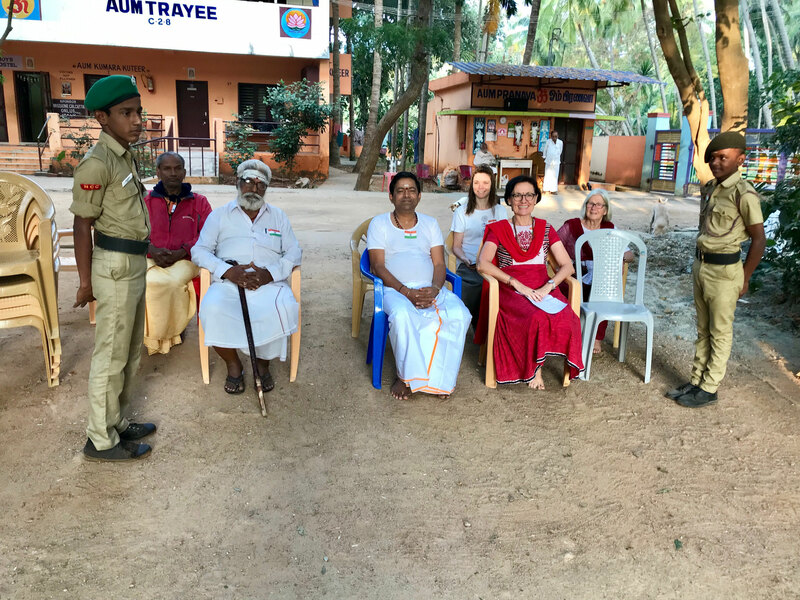 More than ten years ago, she "settled" down under a tree opposite the main entrance to a Five-Star-Hotel in Courtallam, a touristic spot not too far away from us. One day, the tree was cut, at which point she moved to the other side of the road, under another tree right in front of the same hotel. This tree was also cut, but "Paati" did not move away from this spot and is living there to this day. Visvanathan spotted her long ago, but due to her firm, rejective stance, it was difficult to help her with anything at all. 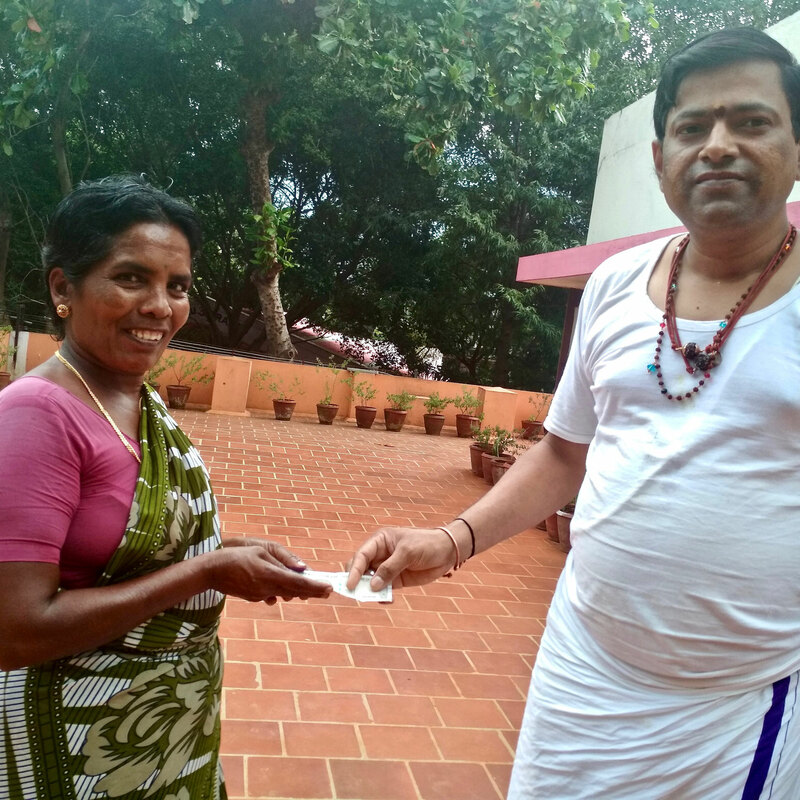 Gradually, she would allow him to bring her food and fresh water from the ashram, which he continued doing for a whole year. He might have been the only person, she talked to at that time. He was called upon as a mediator by the Hotel Management who sincerely tried to improve relations with her. 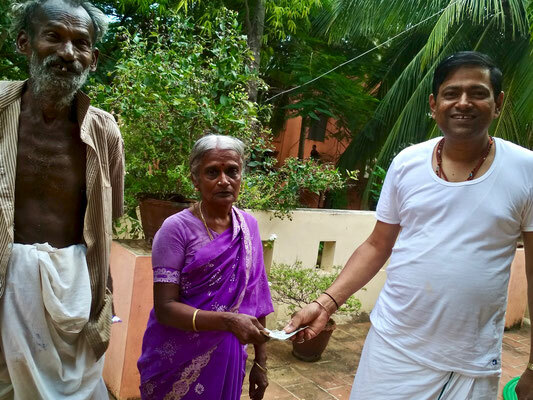 Some people, having witnessed the efforts of our ashram-head to improve her living conditions, took it upon themselves to continue the task of providing her food and water from a nearby shop. A large umbrella was erected over her head and got covered with large plastic planes to protect her from rain and direct sunlight. Courtallam Paati, as we call her, knows a few Indian languages, but her expression remains encrypted and limited. She still rejects conversation or personal contact. An example of one of the A4 sheets of paper written by Thaatha. 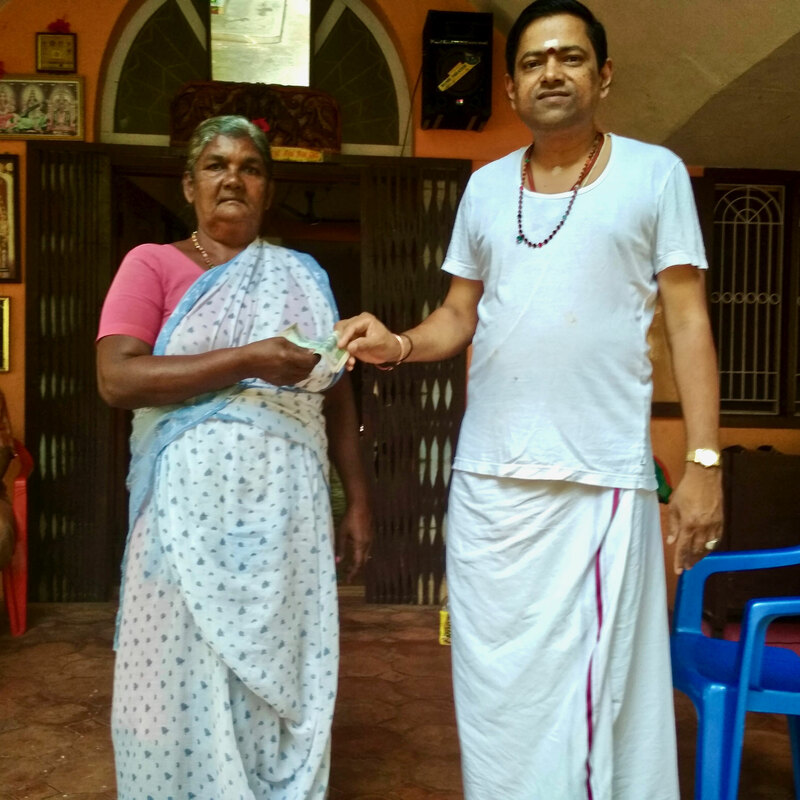 Visvanathan and 'Courtallam Paati’ ("Patti" meaning Granny in English). Refreshing memory of the children's Christmas Song in December 2018. As a German native speaker, I have to congratulate the kids on their remarkably clear German accent! The children loved practicing and had great fun! 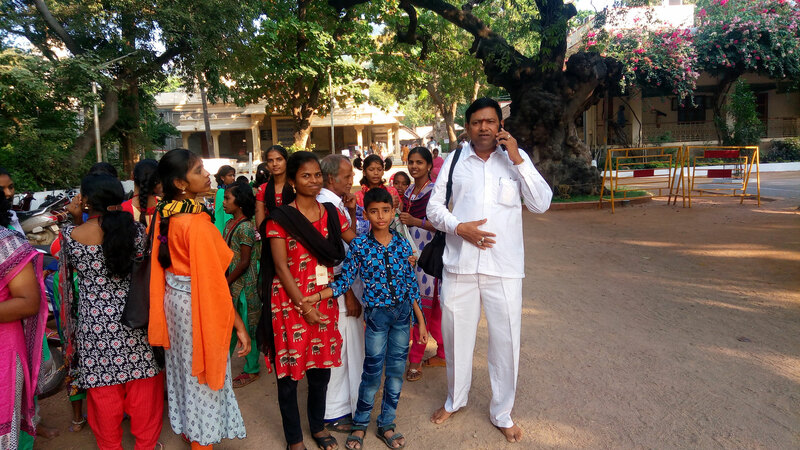 The photos from the gallery to the left were taken during our trip to Puttaparthi in December 2018. 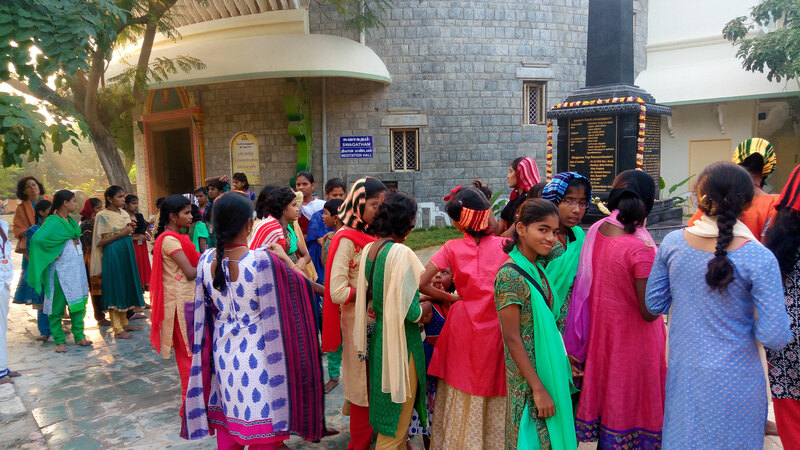 Puttparthi is home to "Prashanthi Nilayam," one of the largest ashrams in India, close to the metropolitan city Bangalore. 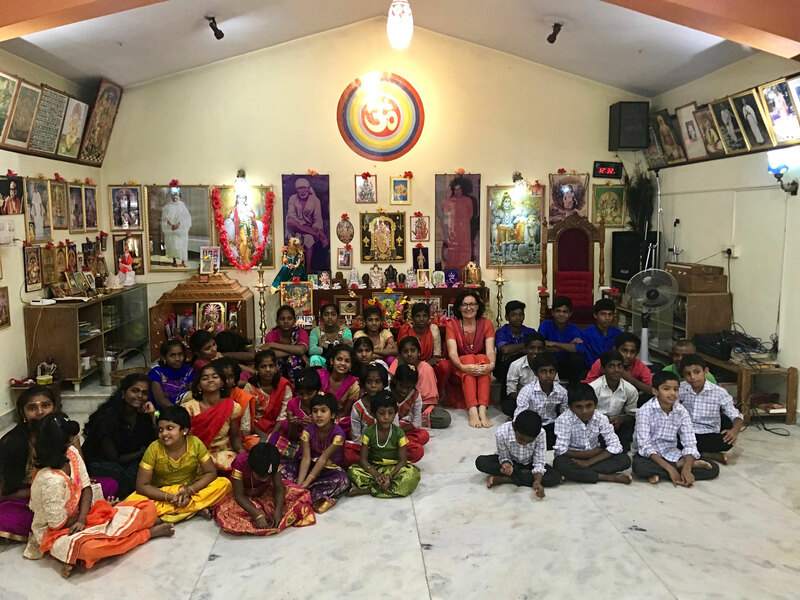 Our first journey to Puttaparthi with all the children took place in June 2006. 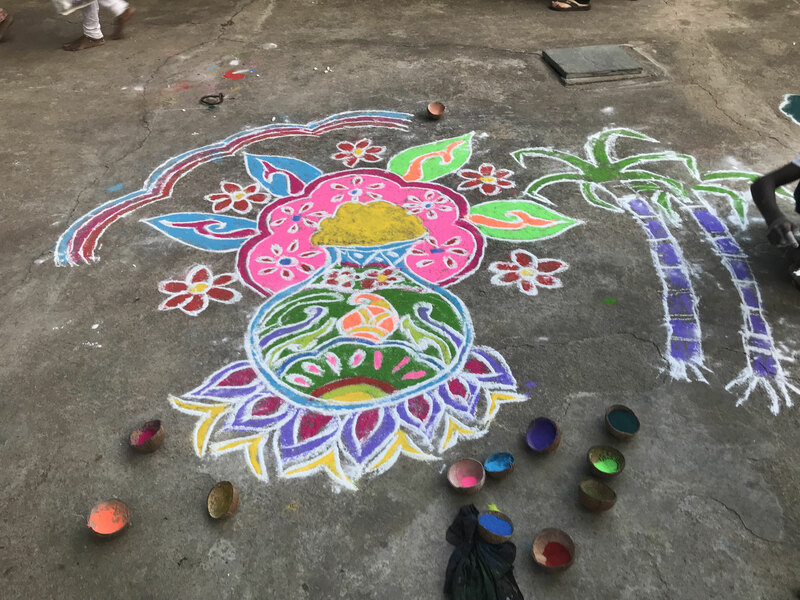 Thanks to the specific support of people who also feel that cultural and spiritual journeys are a good way to promote the children's development and happiness we were able to continue these journeys every year. 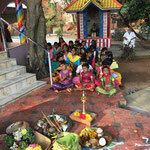 Children love Puttaparthi and continue to do so even after the demise of Sri Sathya Sai Baba in April 2011. 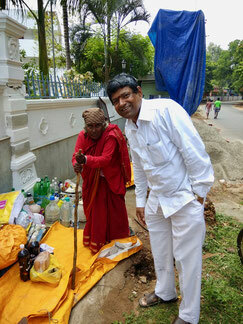 On our way to and from Puttaparthi, we visit other places of cultural/historical/spiritual importance. 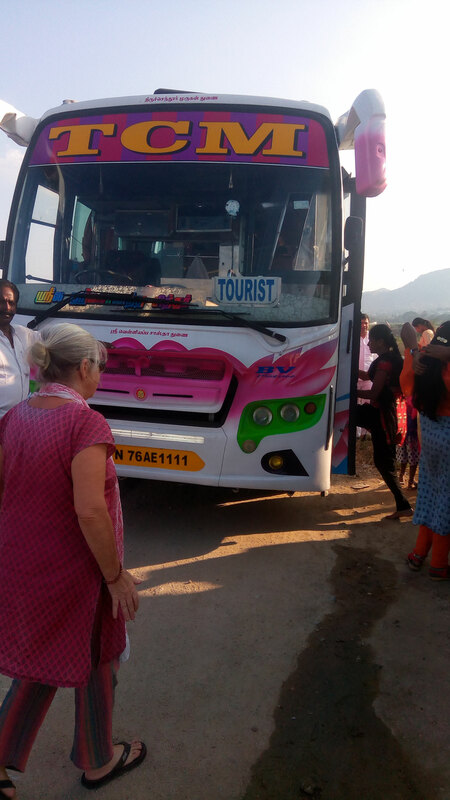 Other places on the list of travel destinations with the children are Tiruvannamalai, Tirupathi, Trichy, Palani, Madurai and smaller places nearby Tenkasi. Traveling means excitement and fun which is exactly what is needed to brighten up the grey zone of every-day school routine. 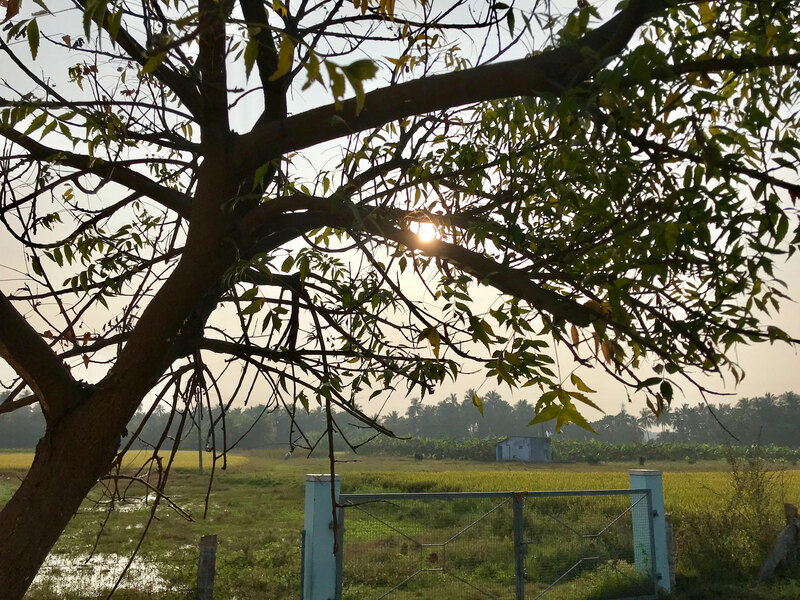 "Winter" in South India looks like spring in colder countries. Nature is lush and green, the sunrays are mild and the air is cool. Last year, in December'18 and January'19, the temperatures fell below 20 (heavenly) degrees Celsius, a low temperature mark which we haven't had for many years in the past. 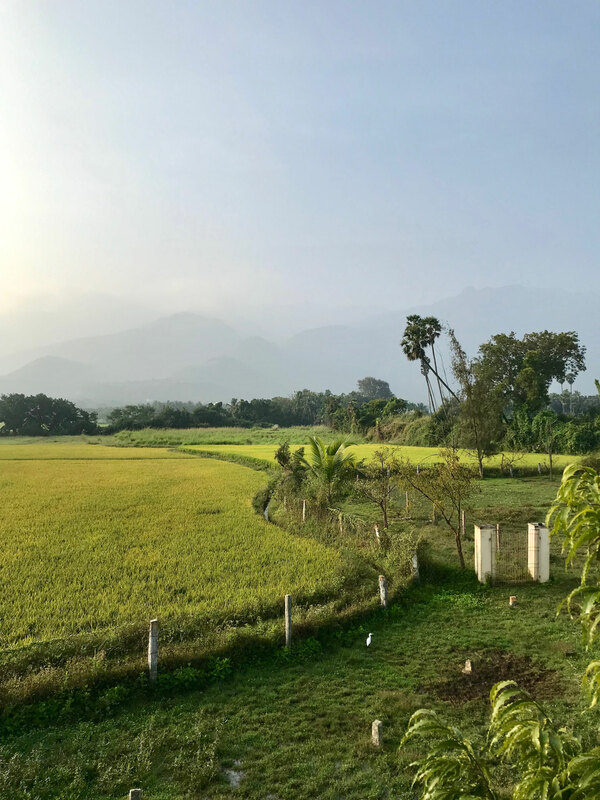 The local, South Indian people are not much exposed to such 'cold' climate and dig out jackets and sweaters, wool caps, and pullovers to reduce the shivering and chattering of teeth! 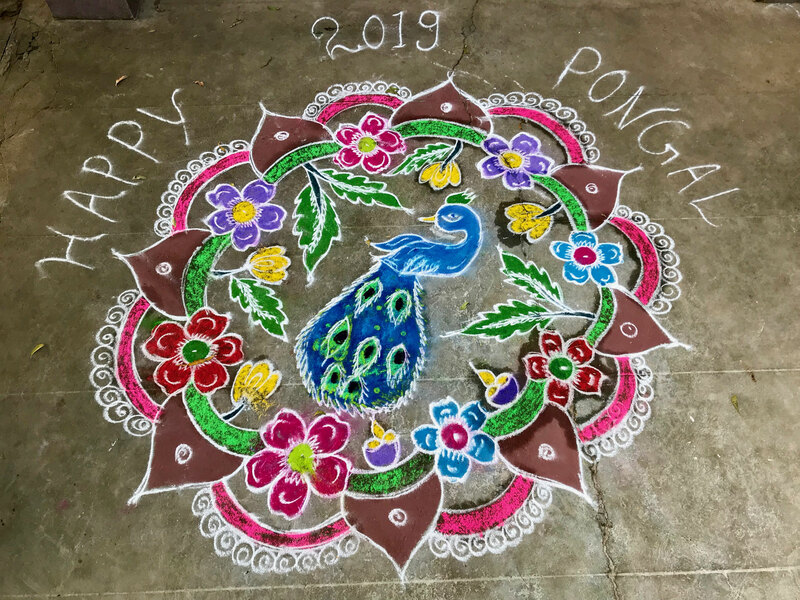 Pongal marks the Indic solstice, the sun starts its six-month-long journey northwards (Uttaraayanam). 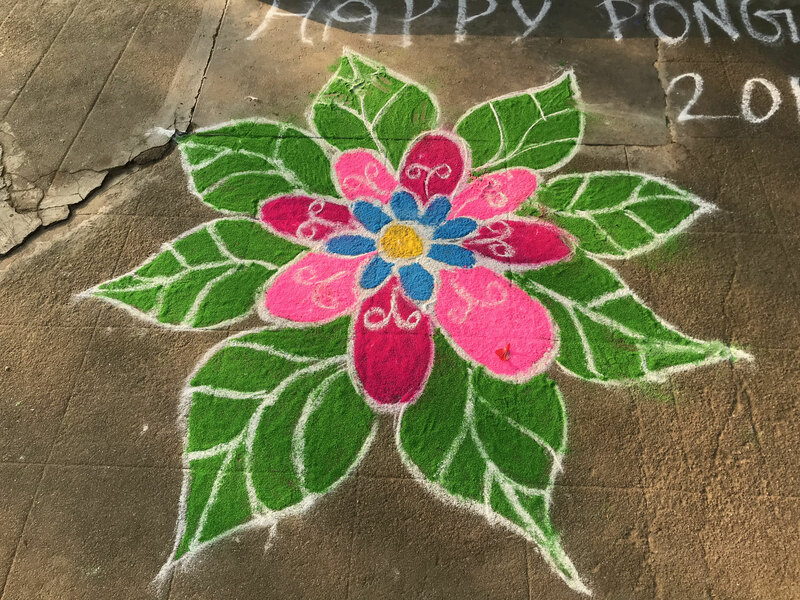 It is a harvest festival, on which people thank the SUN for the successful first harvest in January. 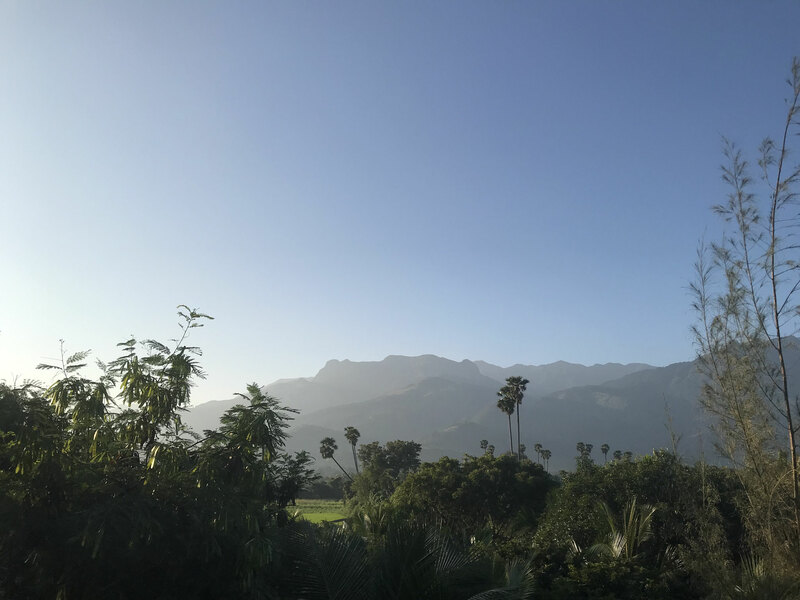 Additional information: Being located close to the equator, the lengths of days and nights in our zone are almost the same throughout the year. The difference between the shorter and longer days ranges from about one to one and half hours during winter and summer months. 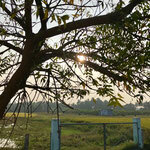 The longest day in South India is the 21st of June, on which the sun will set at around 7:15 PM. 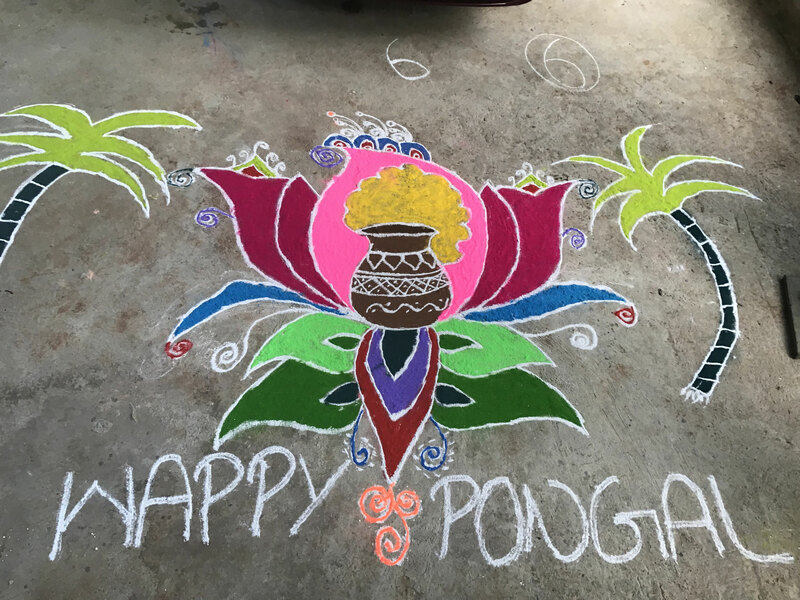 The "Pongal Games" have become traditional in the Aum Pranava Ashram. 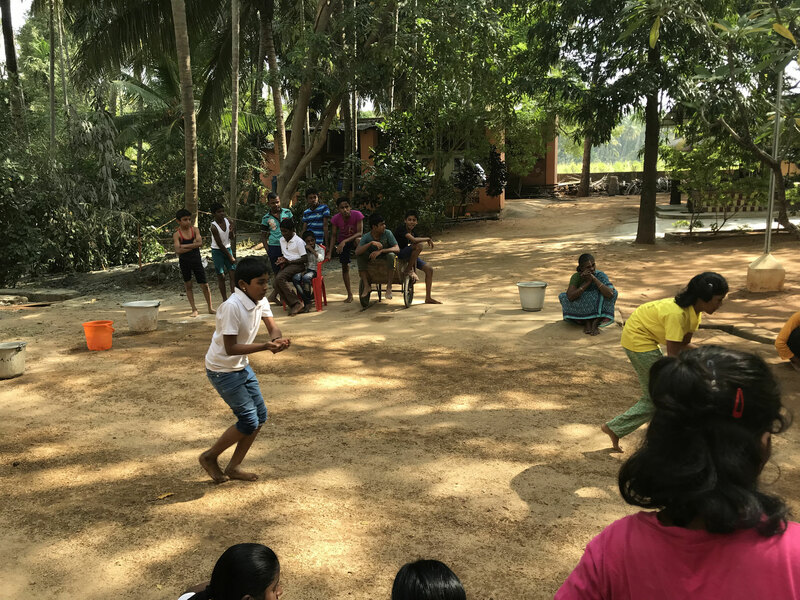 On the previous day of Thai Pongal, we organize competitions for the kids in the fields of creativity, sports and quiz. 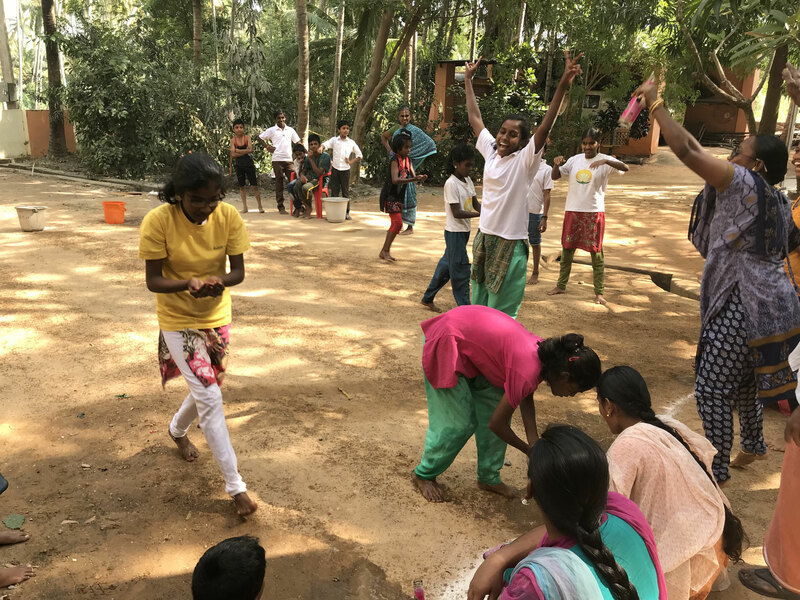 I hope that the photos and videos below can convey the joy and fun which the children had during those two days! 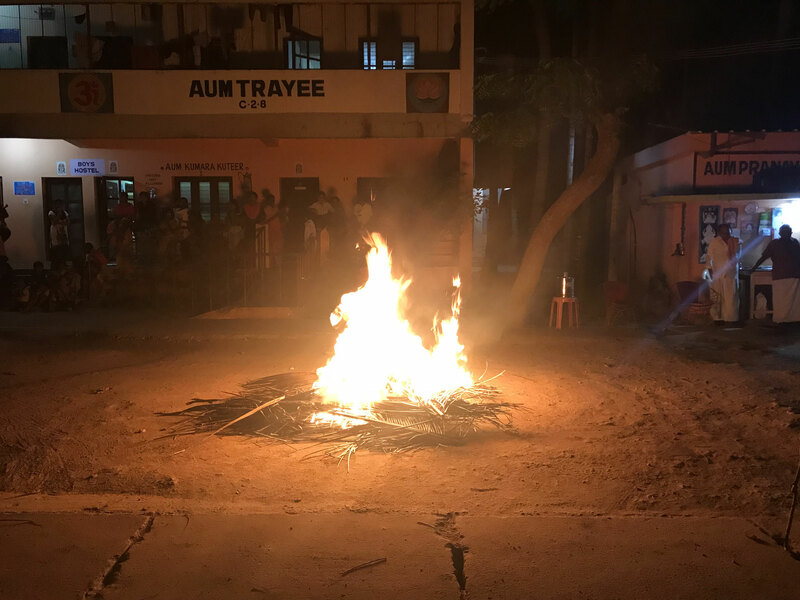 The last video is the recording of a Bharathanatyam Dance of a young lady, who performed for the kids in the ashram in our prayer hall on the eve of Bhogi Pongal. I have uploaded all of her dances on our Youtube channel: Aum Pranava Ashram. 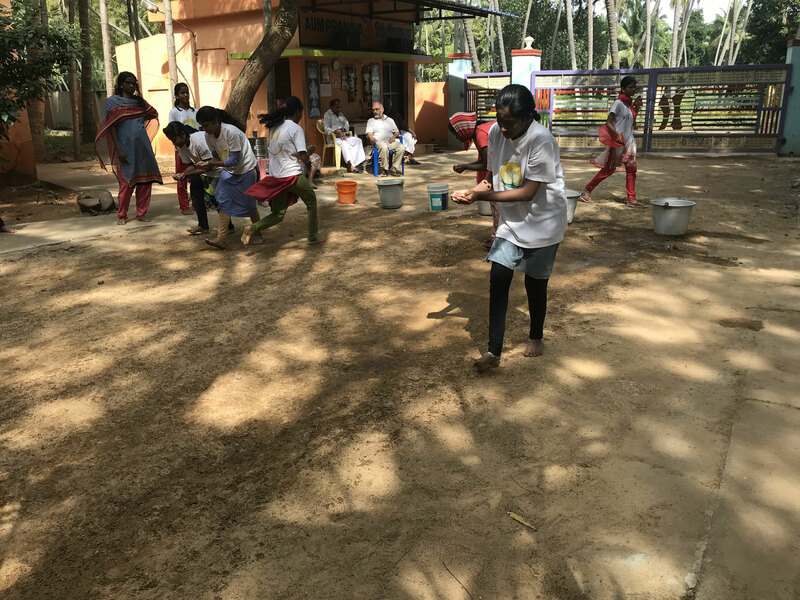 “The Pongal Games” at the Aum Pranava Ashram were first held in 2005. 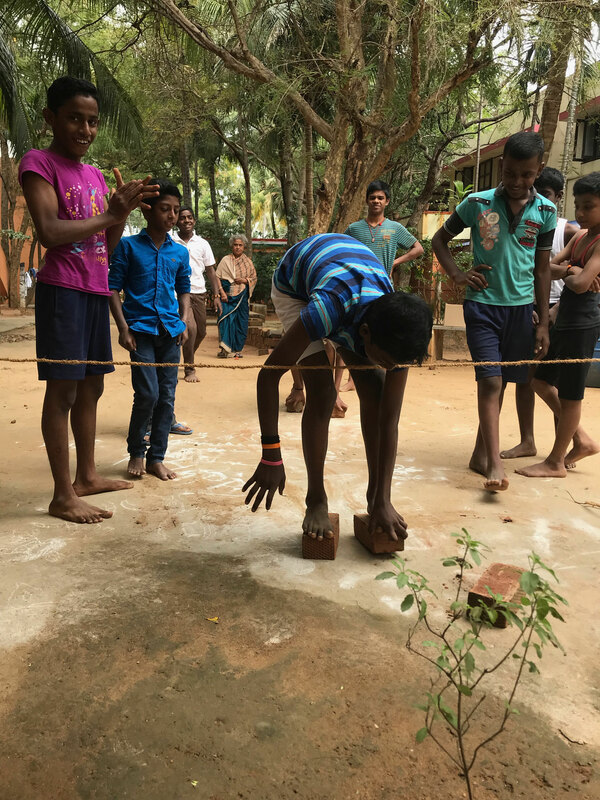 The competitions take place in the fields of sports, creativity and quiz. 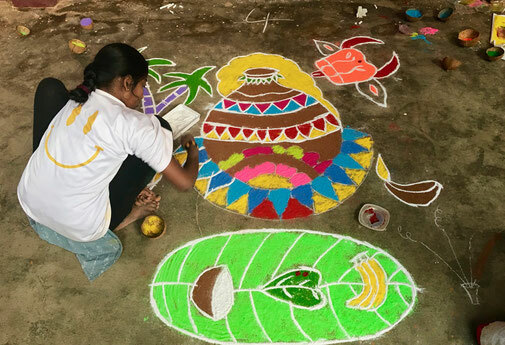 Above: Indhuja, 14 years, laying out her “Rangoli"
A few more master pieces laid out by our High School Girls. 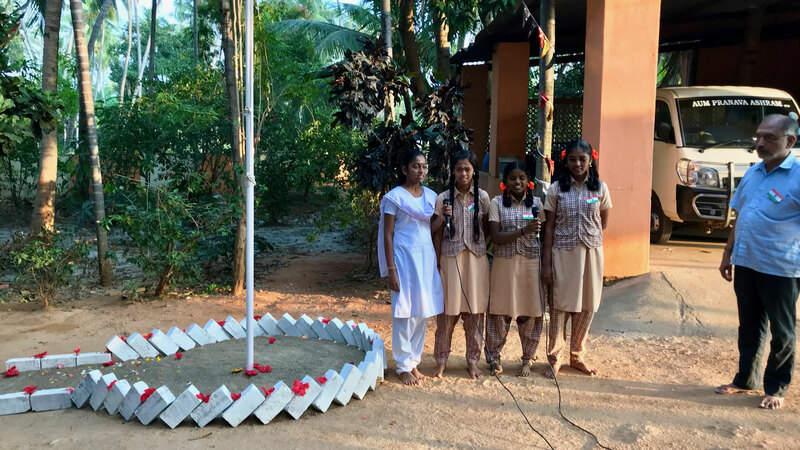 Speeches about various freedom fighters and Republican Heroes, national songs, and poems of national importance are the annual Republic Day program's main points. More photos have been uploaded in the gallery. 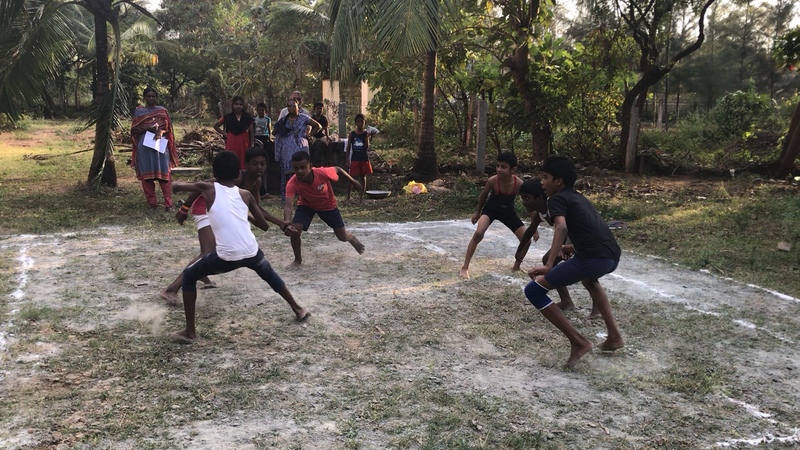 All Schools organize annual sports meets. They also award academic prizes for the marks scored during the half-yearly exams. 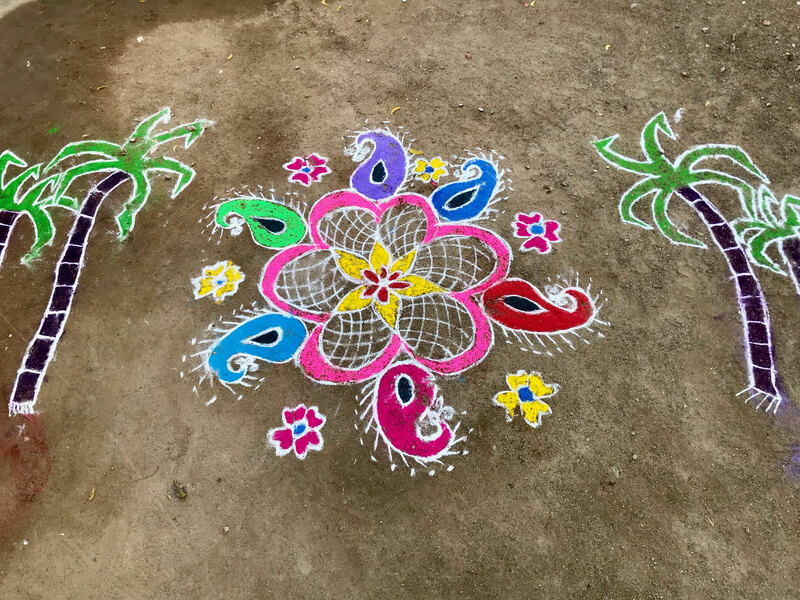 Sornalakshmi from the XIIth std. won two prizes in the disciplines of Shot Put and 1500 m Running. With these two prizes, she also bagged the championship award. Velmurugan from VIth std. got a prize for the marks scored in the Half-Yearly exams under the excellent tutelage of Heide Fricke, who learned every day with him and helped him with his homework. The third and youngest winner was Dhanshika from the Upper Kindergarden who won a prize for the recitation of poems. We congratulate the winners for their remarkable performances! 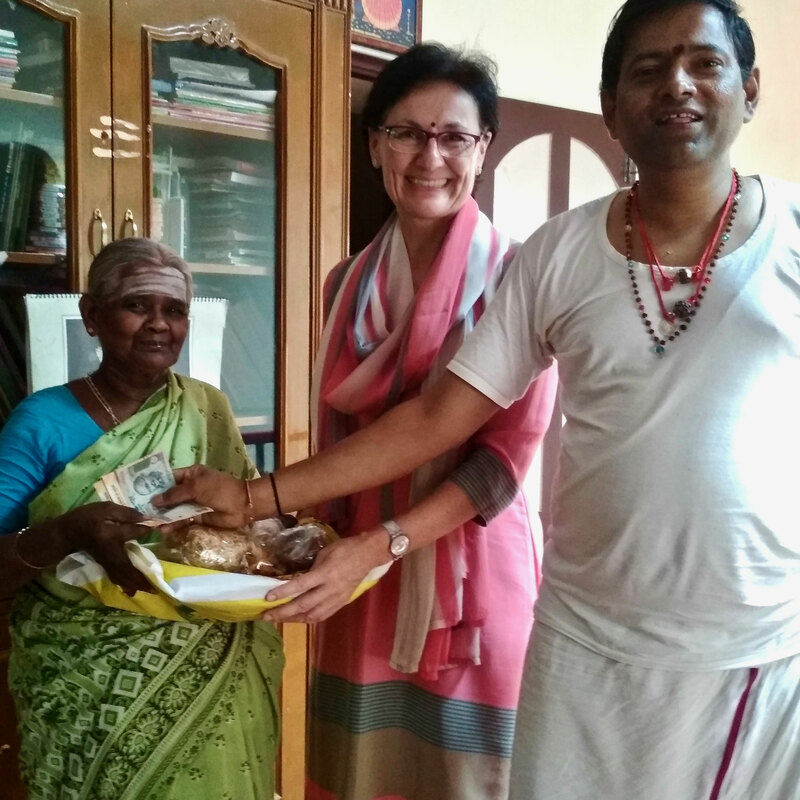 The picture on the left side shows Heidemarie Fricke from Germany, Velmurugan, Dhanshika and Sornalakshmi. 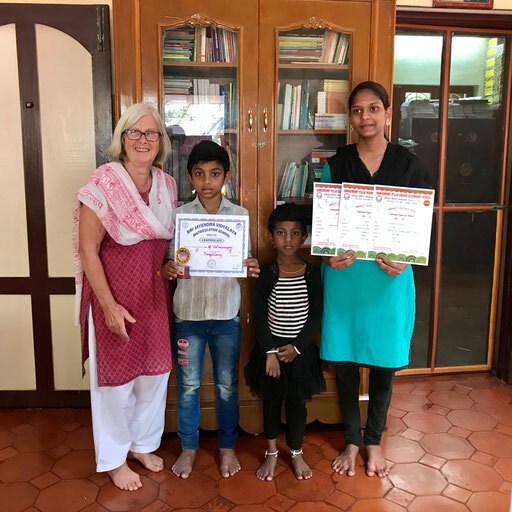 Heide is a retired Montessori teacher, who visits us every year and spends a lot of time with the children to help them with their studies. Due to her most preciously seasoned experience, Heide is capable to open the children's mind for the subjects which they are learning. In this place, I would like to mention a few other close friends who visit us regularly since many years, stay for a minimum of a month and help the children with homework, studies, and play! Our best friend and coffee-buddy Katharina Reiter, a wonderful teacher from Vienna, who comes twice every year to spend time with the kids and the other ashram family members; Marie Beaney, an excellent Yoga teacher from England, who has fallen in love with the kids and vice versa; and another long-time friend by name Mark from Germany, who is one of our most beloved, longest-term friend and supporter. Their regular visits mean a lot to the children and help them to forge a relationship of love and trust. We want to use this space to thank our exceptional friends for all their love and help and support which they have delivered over so many years! 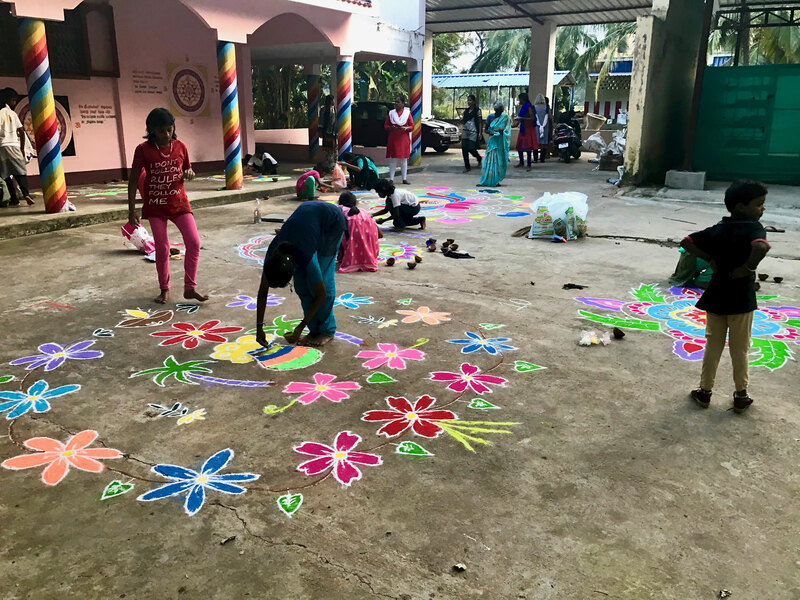 Perhaps, their example could inspire readers who would also like to spend a few months away from the regular routine and help children or the ashram in whatever way possible? 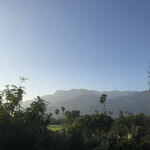 We do have space for visitors and volunteers who would like to stay for some time in the ashram. More information can be found on the Volunteering Page of our website. A staggering 15.5 Million children graduated from XII std in India in March 2018; 19.9 Million children completed X std State Board Exams. No exaggerations here! 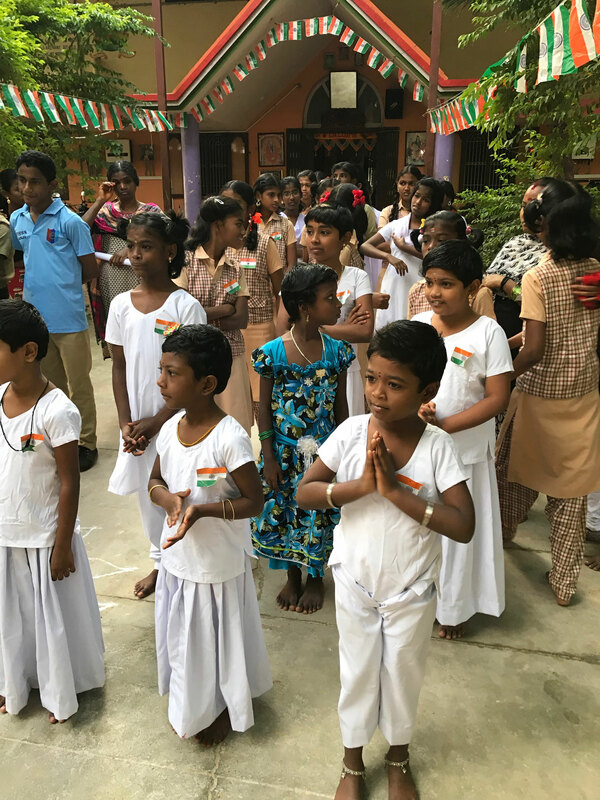 In Tamil Nadu alone, 900.000 candidates appeared for XII Grade State Board Exams, followed by 860.000 children writing XI Class Exams. The X Class State Board Exam was written by more than 1 Million children in Tamil Nadu. All Exams for X, XI, and XII Grades are conducted at the same time with the same question papers throughout India. 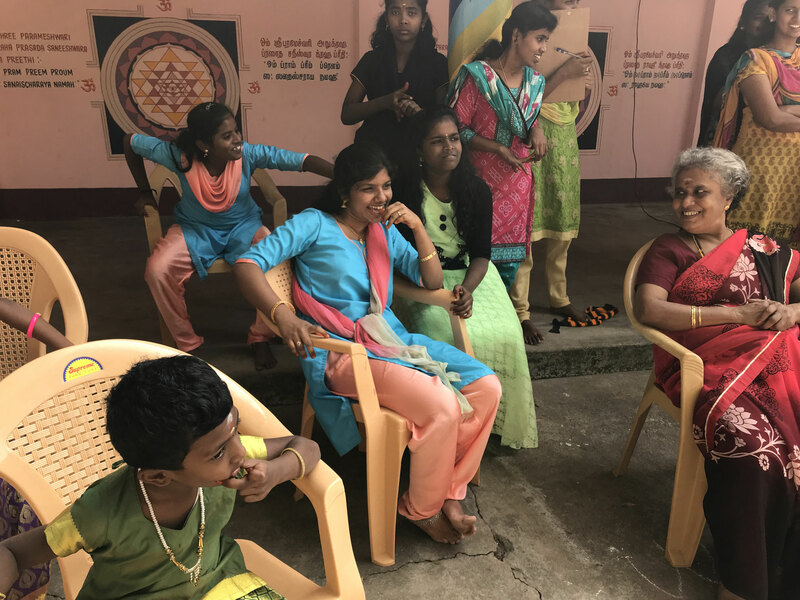 In our ashram, two girls have graduated XII std, Sornalakshmi and Saroja (cf. photo below). Saroja studied Maths/Biology group for the last two years, and would like to go for a degree in Pharmacy. 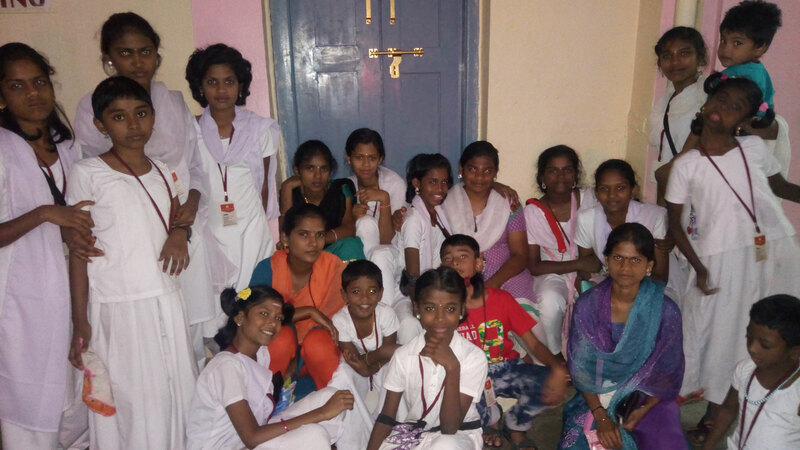 Sornalakshmi's group was Computer/Accountancy and she is interested in Business and Administration Management. Both set high goals for themselves. Before we can make any decisions about their Higher Studies, we have to wait for the results of their exams which are expected to be announced in the second week of April. We all hope for the best and wish them success! 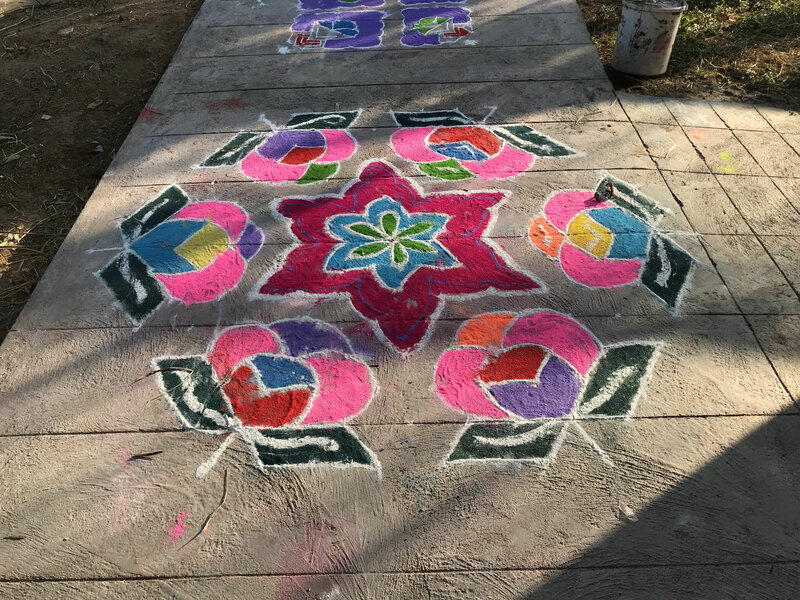 Sneha and Kausalya, XI standard. Sabarinathan, X standard graduate. 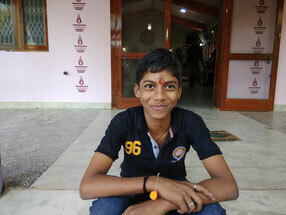 He will leave school and get admitted for a 3-year-course at a Polytechnical Institute. Summer holidays start early this year due to the upcoming National Elections in April 2019. At present, India is home to 1.4 Billion Indian citizens, thus forming one of the largest global democracies on the surface of this earth. The elections will take place over the timespan of a whole month, with the zonal elections being held in various batches in the different states. While being completely non-political, we pray for a peaceful and honest polling and for an efficient governing team! 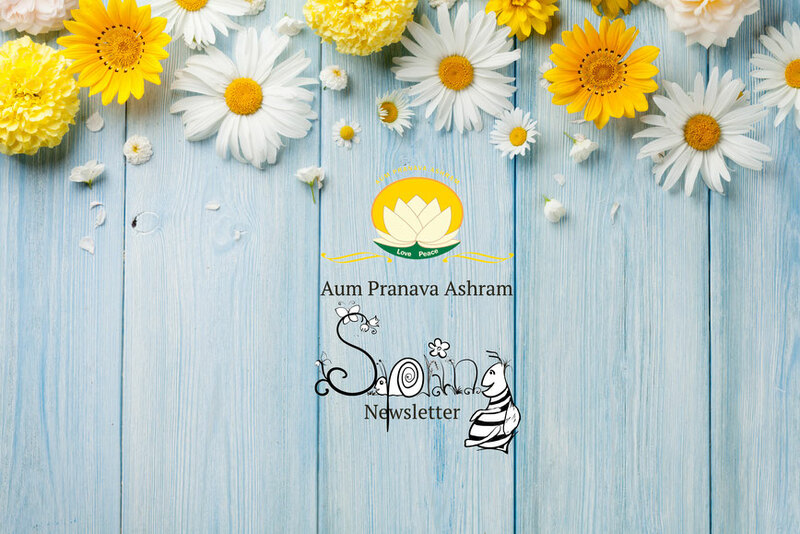 Our next newsletter will appear in July 2019 and will be dedicated to throwing light on the topic "Ashram" and various terms closely related to it. In this context, "Sanathana Dharma" will also be explained in more detail. We are looking forward to the reactions and feedback from all of you and thank you very much for your continued love, interest and support! 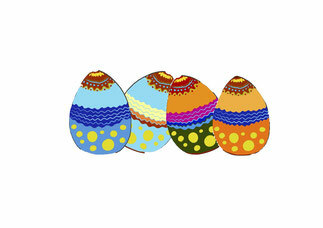 We wish all of you Blessed Easter Celebrations! 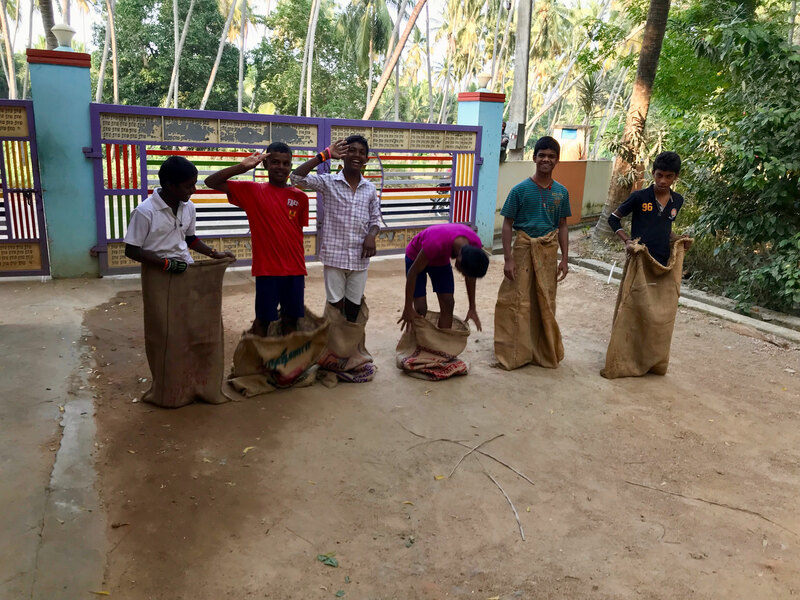 YOGA PRACTICE EVEN THOUGH IT IS A REPETION BUT STILL TO BE A GREENY ON ASHRAM CARE ON HEALTH, KITCHEN STAFF AND PREPARATION OF FOOD FOR CHILDREN AND ELDERS ETC., MAY ALSO BE HIGH LIGHTED. 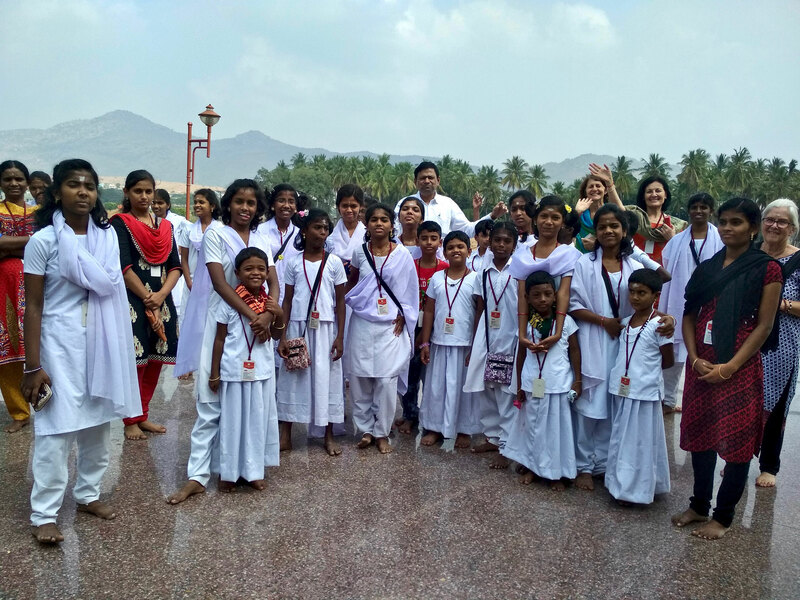 We are happy to be associated with the Ashram, though in a small measure. We are happy to know about various activities of the Ashram. Yes, we would like to continue our help to deserving children for higher studies. You may refer specific cases to us and we shall try to do our best. I think only through education, with all its current pitfalls and shortfalls, a family will get uplifted economically. Only, before they enter their higher education stages, they need to be motivated to do well and excel in their current studies. Again, getting just a degree is not going to help anyone in the years to come. One must excel in whatever field they choose. So, the aspiring children should be counseled to seek appropriate higher education rather than aspiring to be yet another graduate or engineer. We wish you both all success and pray to God Almighty to give you both good health and determination to continue your noble path. 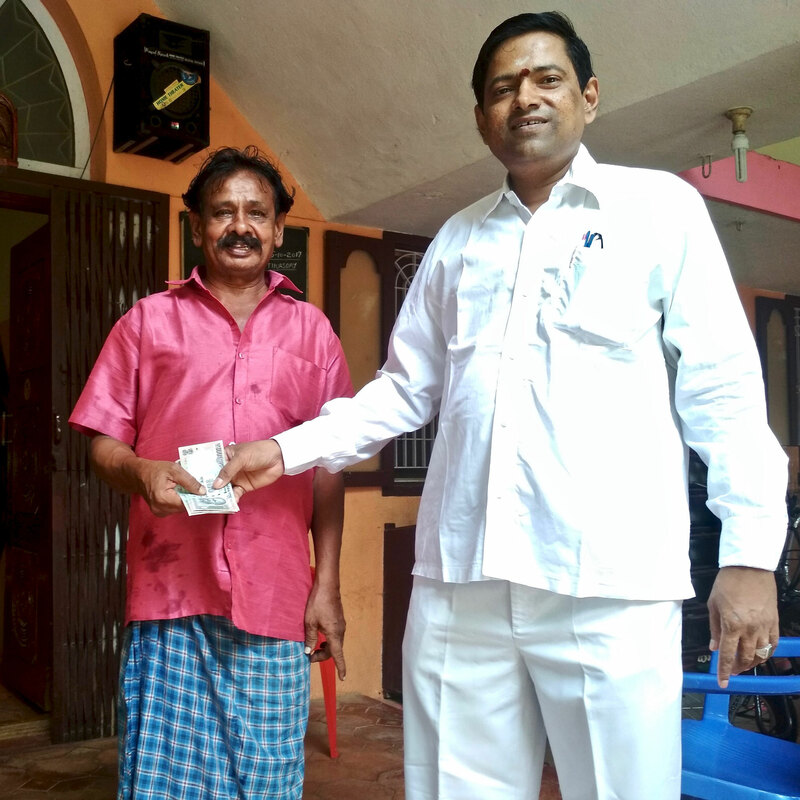 Hi Visu and Traude, what a wonderful newsletter - so sunny and cheerful. I was inspired reading about the last few months and the pictures and videos were very good quality. With the personal stories and photos you have conveyed an intimate portrait of the ashram Life and lives. I am so happy to count you both and all the inmates as some of my life's inspiration!